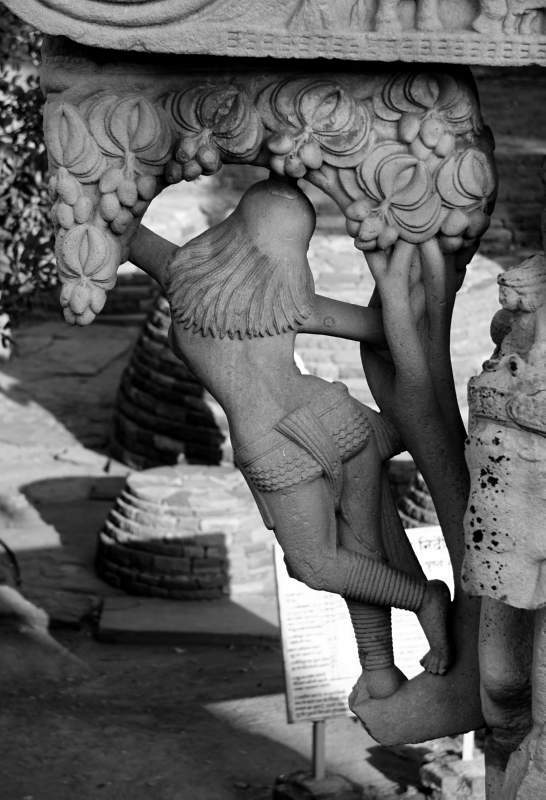 high-definition creative commons photographs from the East Gate of Stupa no. 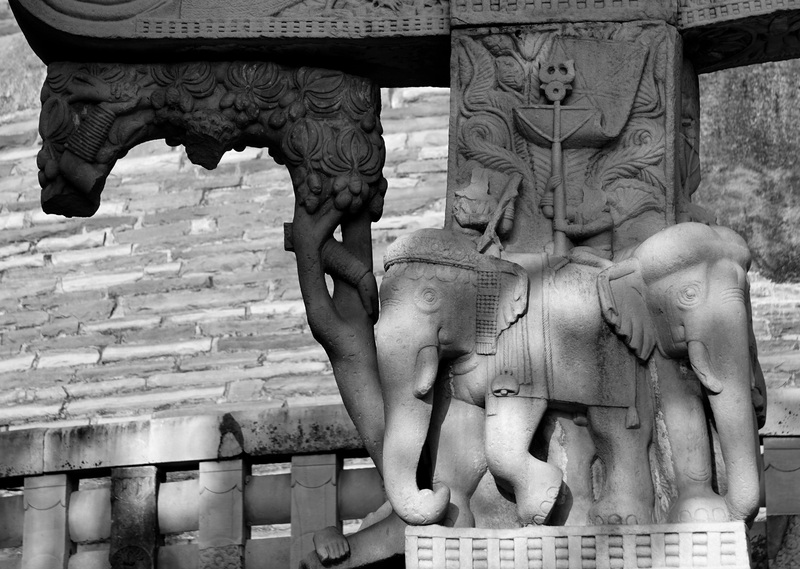 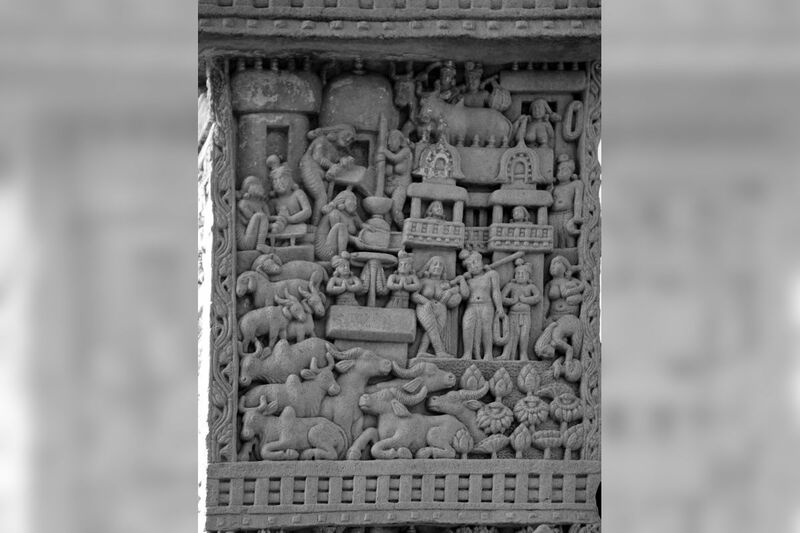 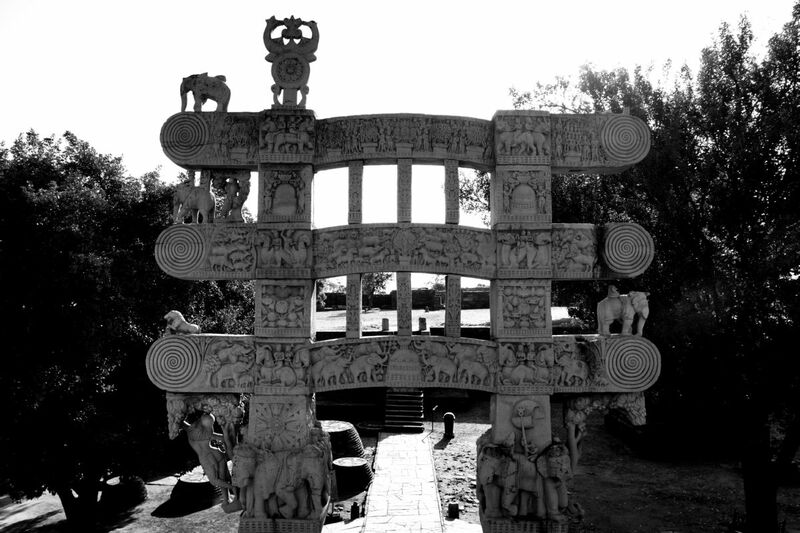 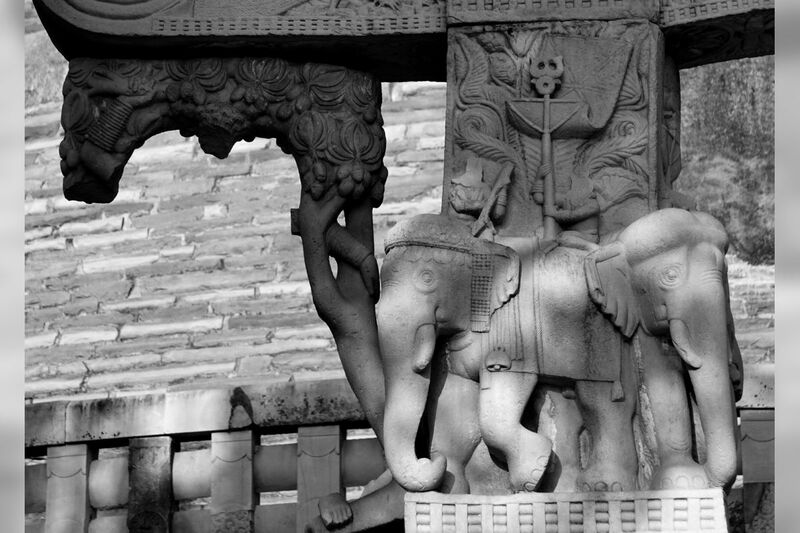 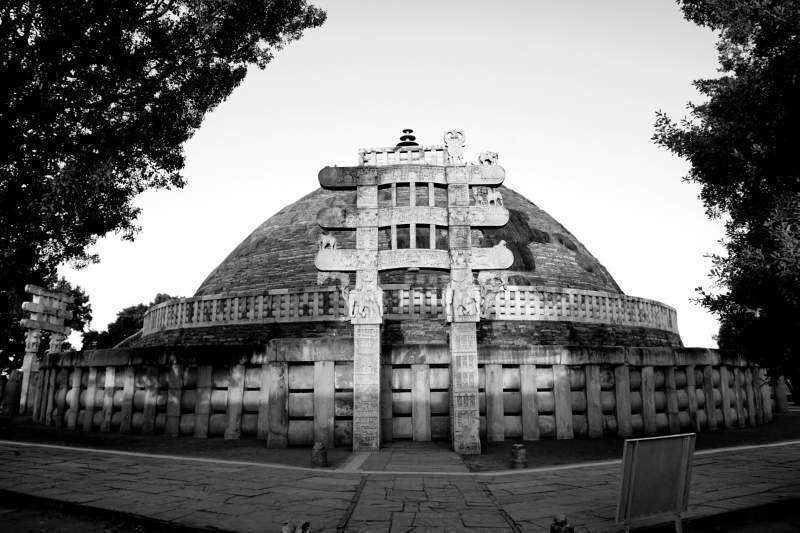 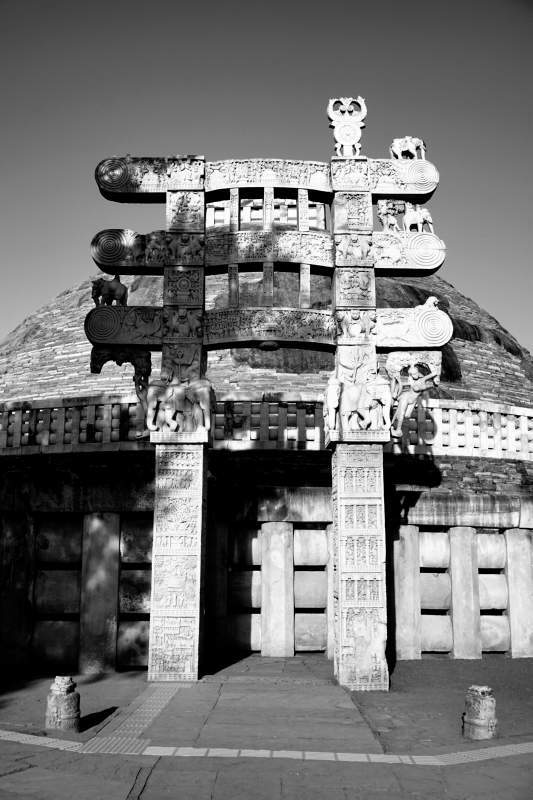 1 at Sanchi, Madhya Pradesh, together with descriptions and some further information. 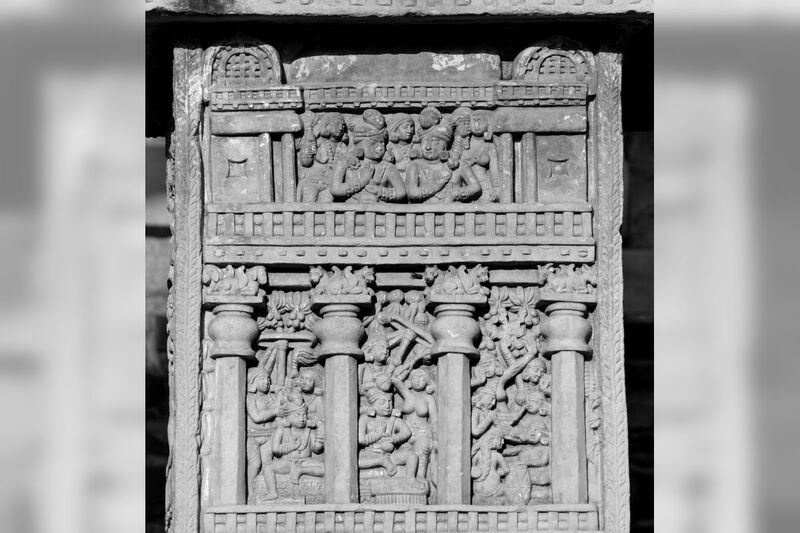 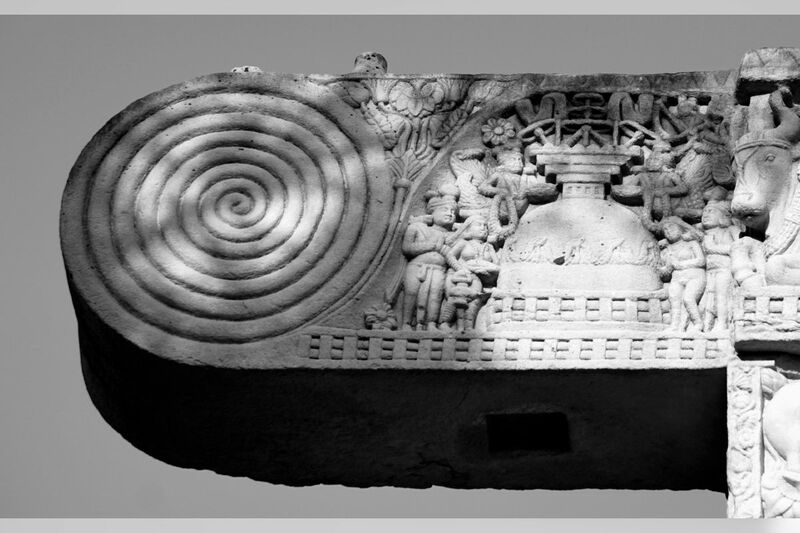 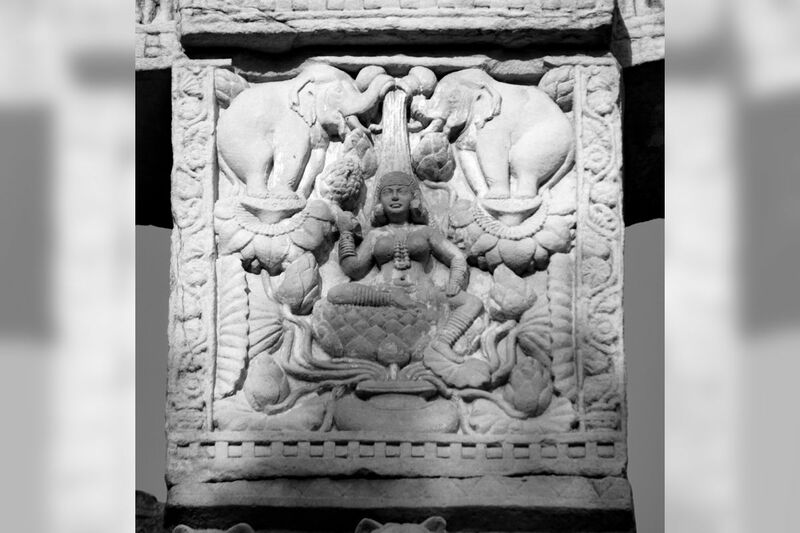 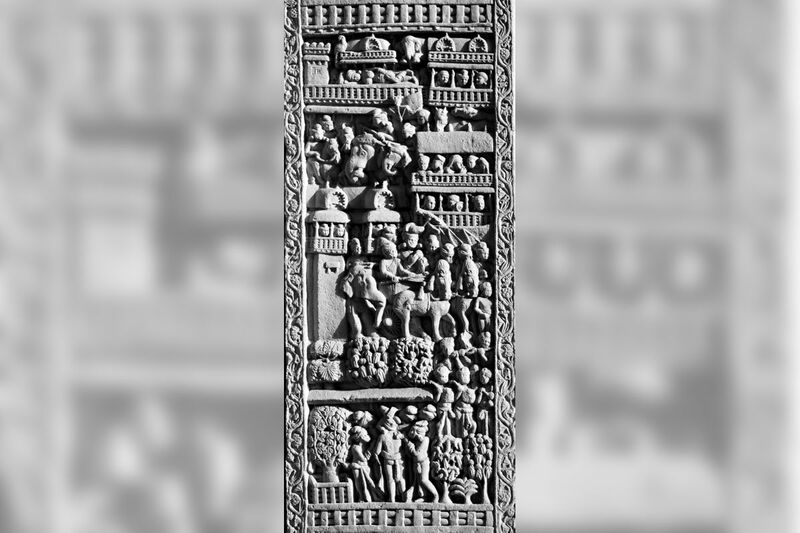 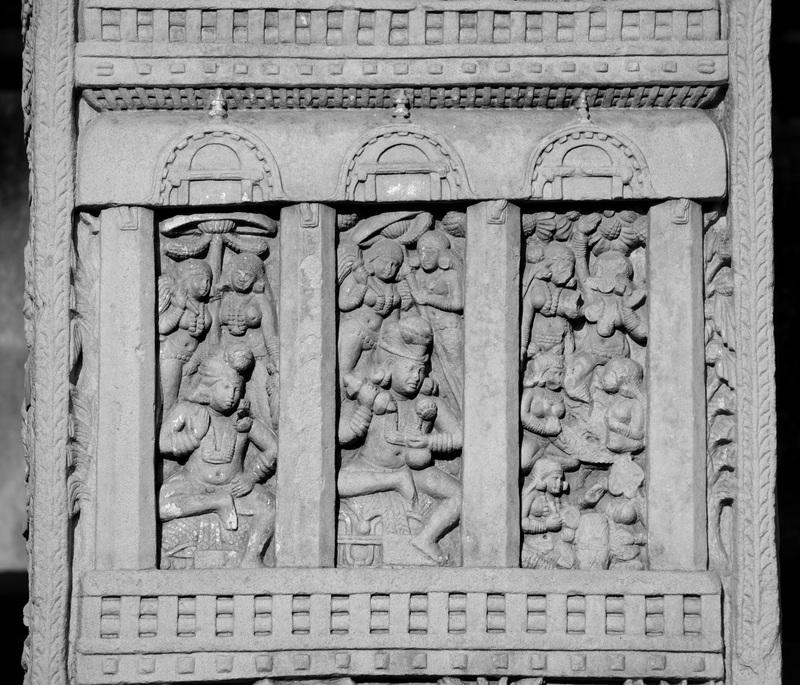 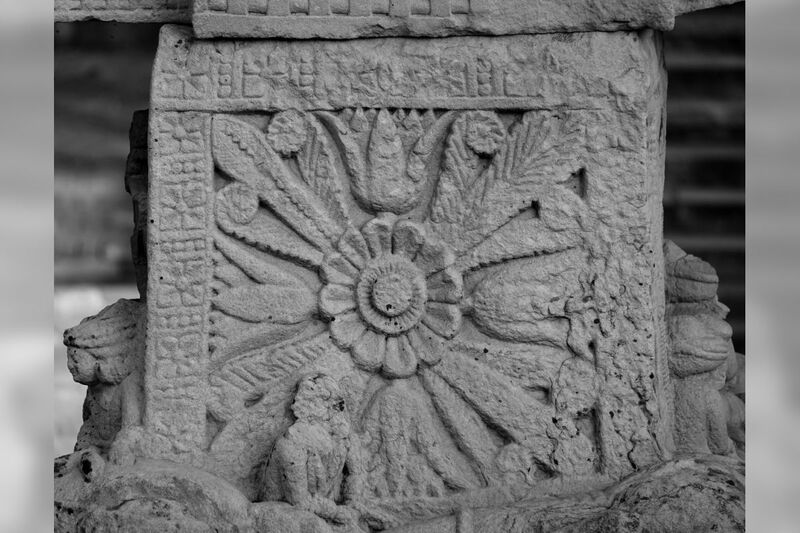 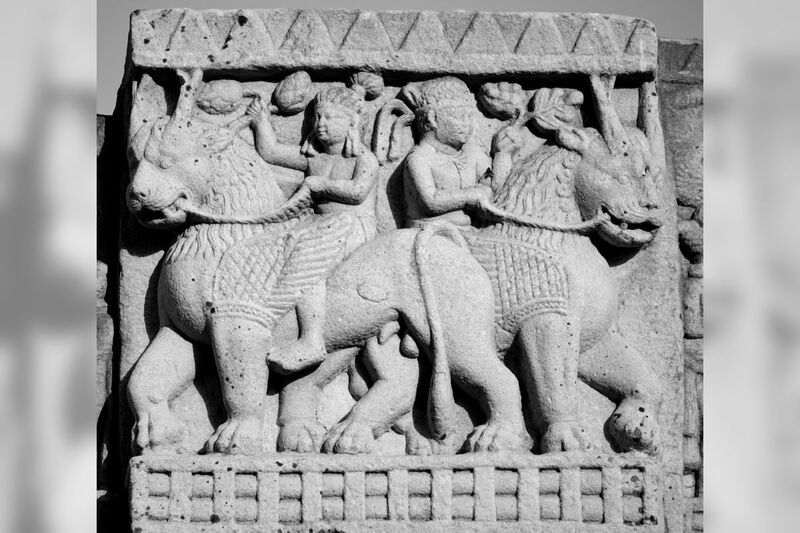 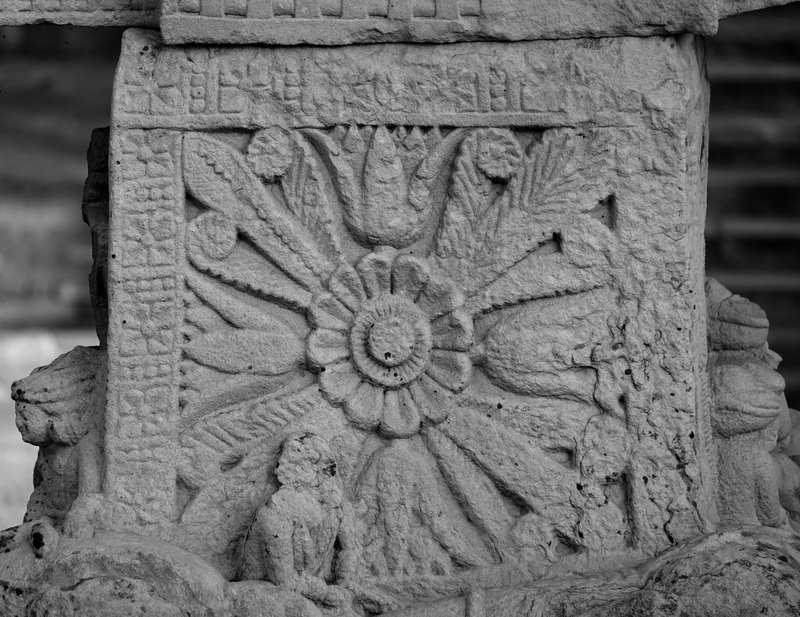 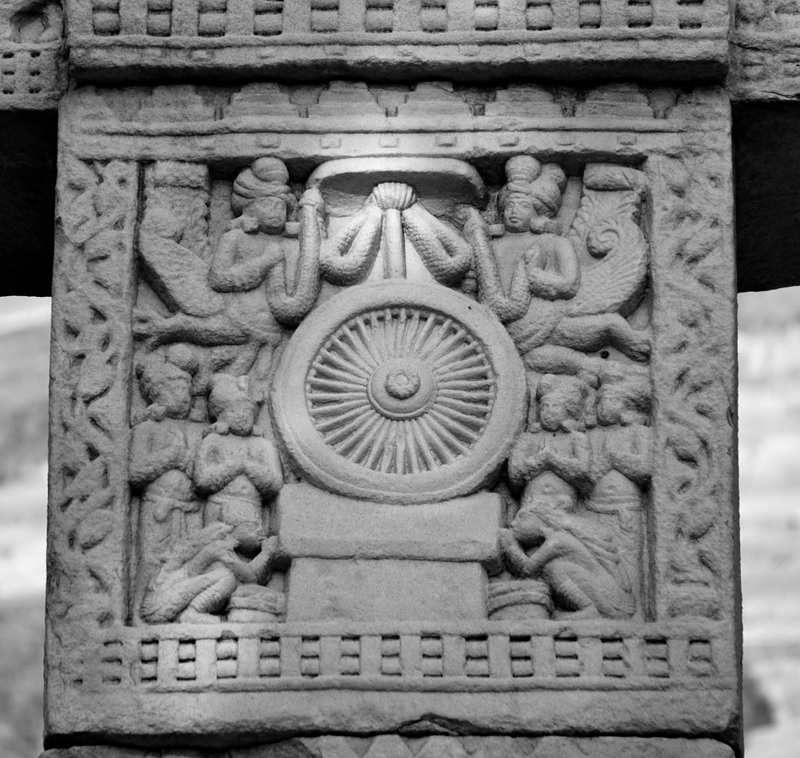 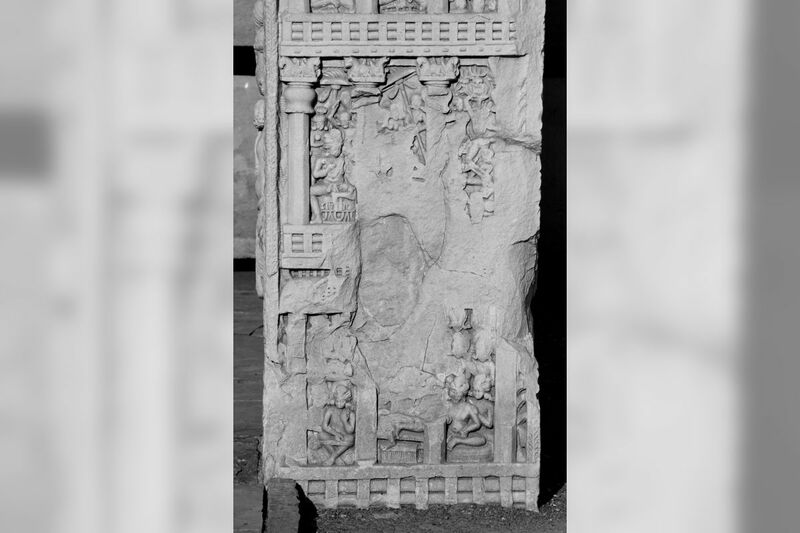 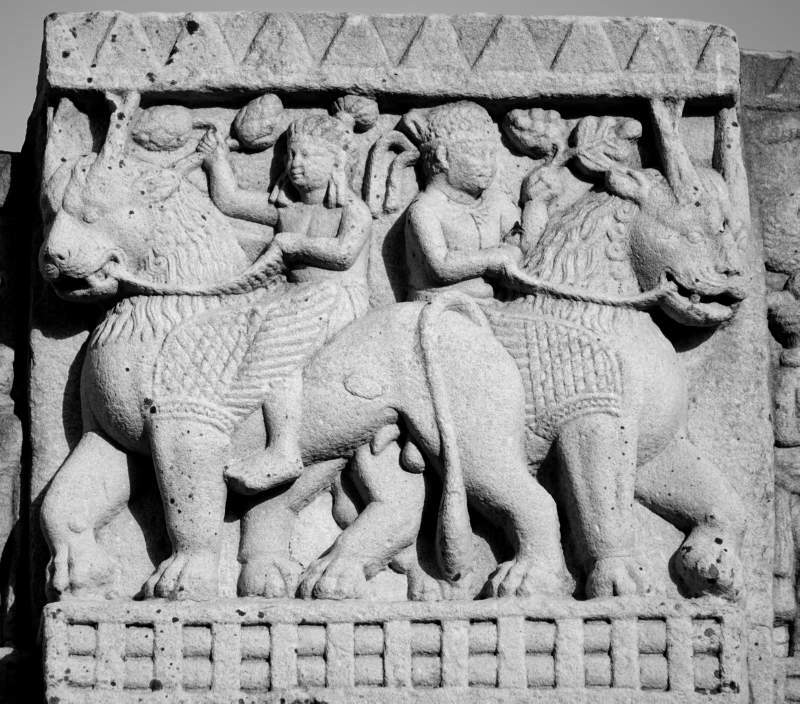 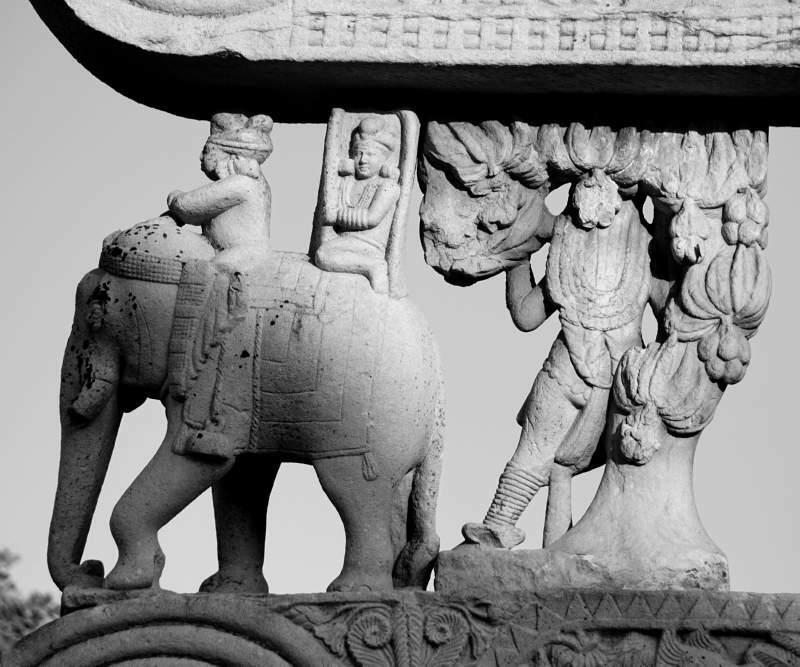 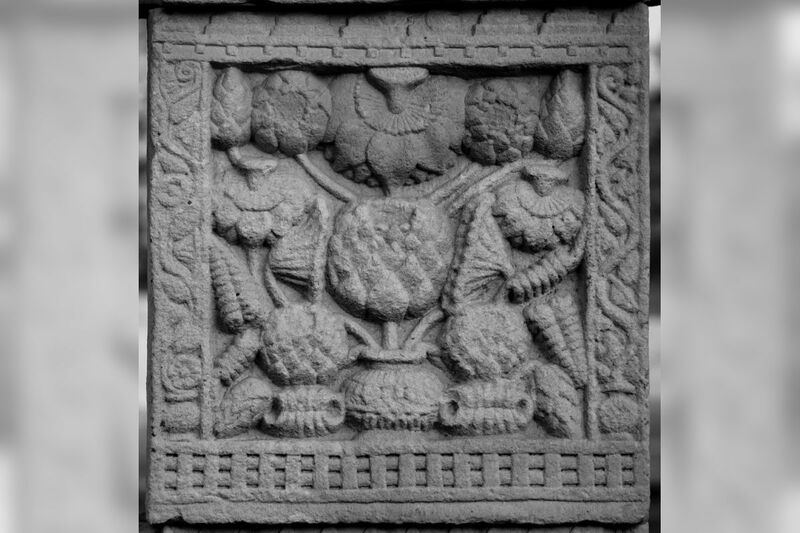 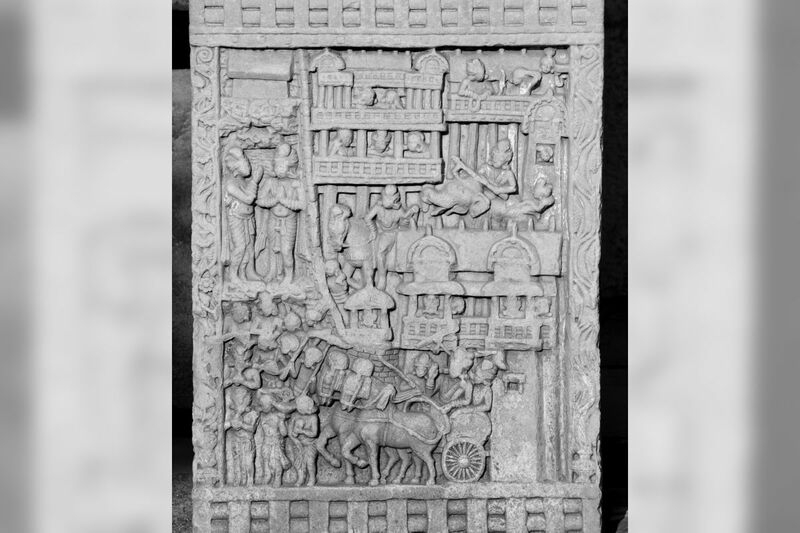 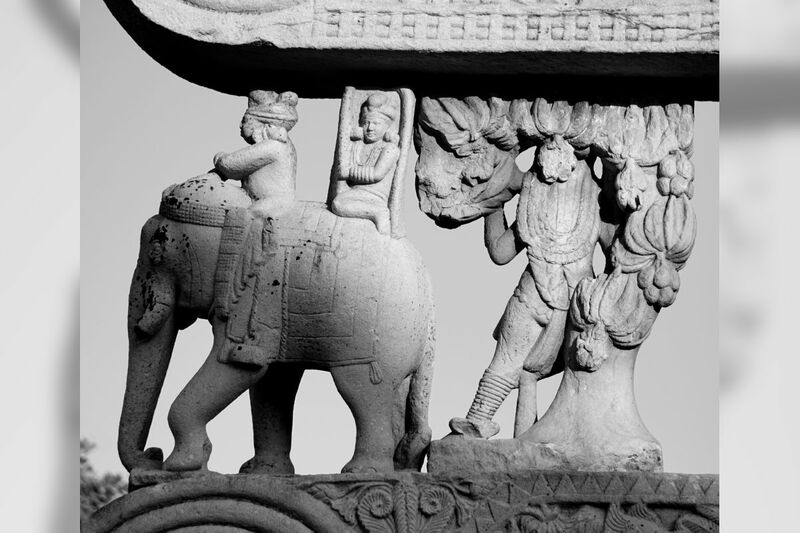 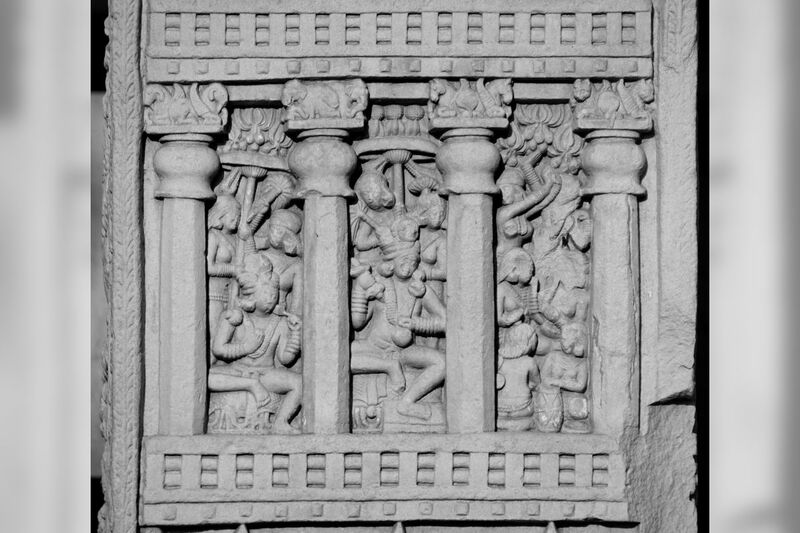 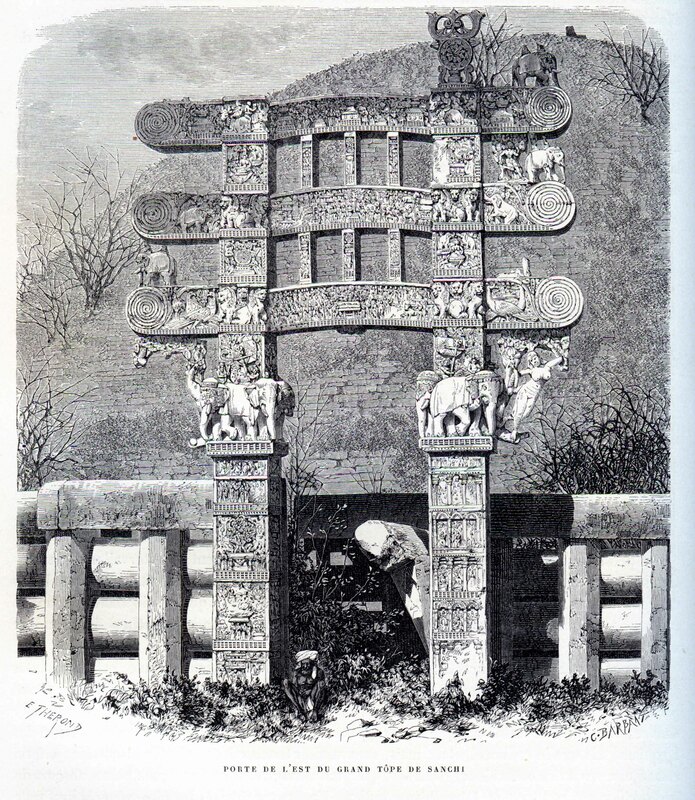 Middle Architrave – Buddha's departure (Mahābhiniṣkramaṇa) from Kapilavastu, the city of his birth. 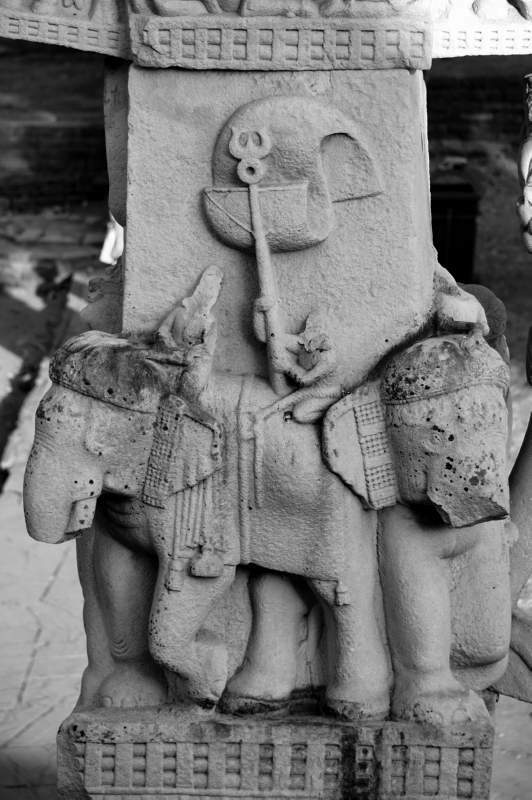 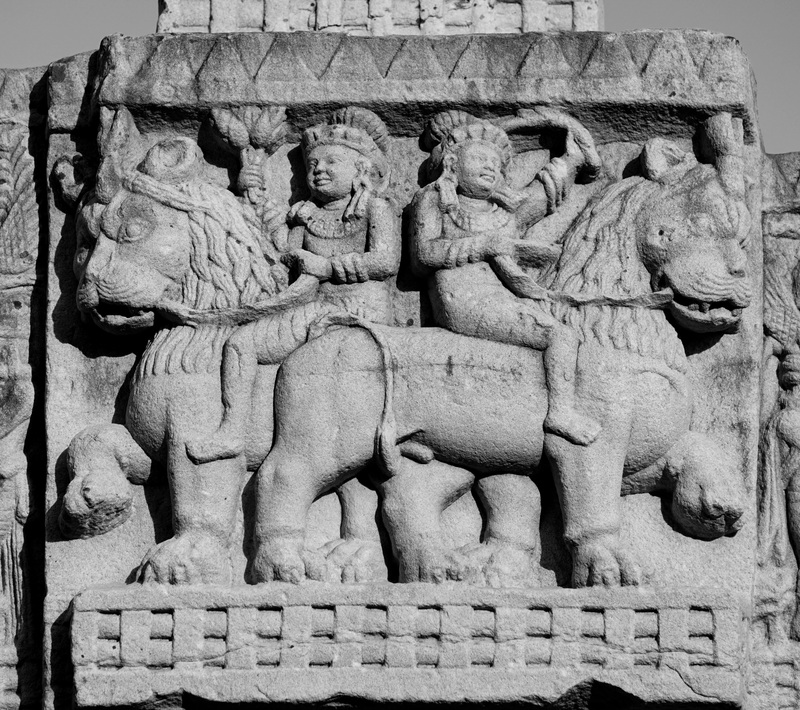 To the left is the city, with wall and moat, and, issuing from its gate, the horse Kaṇṭhaka, his hoofs supported by devas and accompanied by other devas in attendance on the Buddha, and by Chandaka his groom, who holds the umbrella symbolical of his Master's presence. 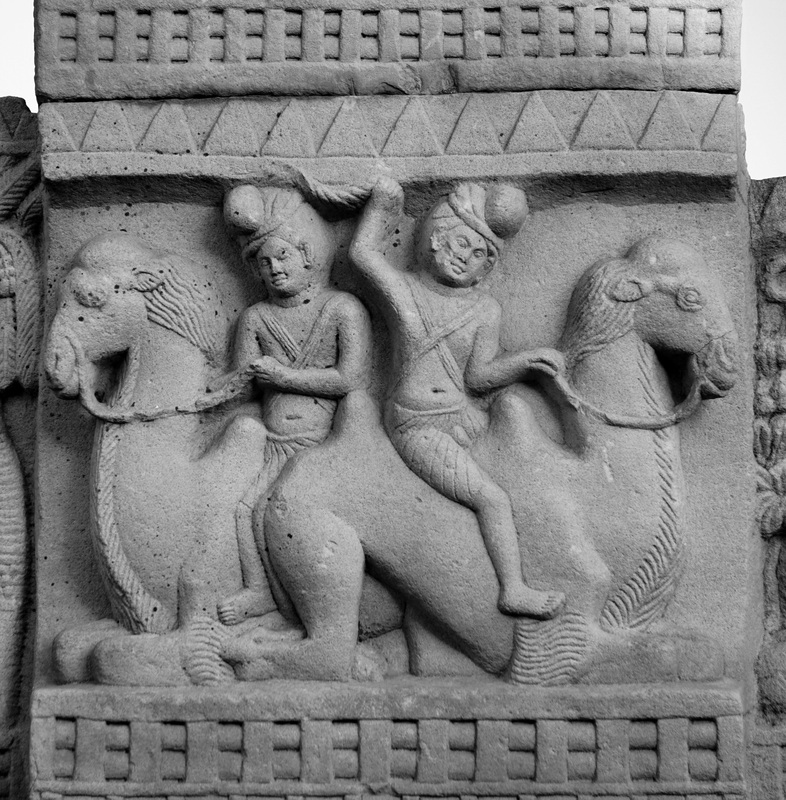 In order to indicate the progress of the Prince, this group is repeated four times in succession towards the right of the relief, and then, at the parting of the ways, we see Chandaka and the horses sent back to Kapilavastu, and the further journey of the Buddha on foot indicated by his sacred footprints surmounted by the umbrella. 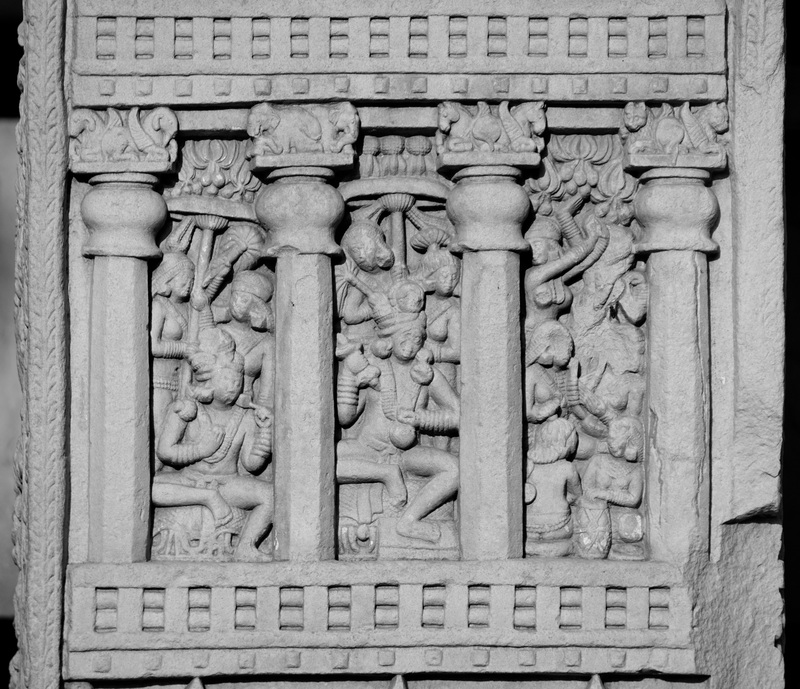 The three sorrowing figures following behind Kaṇṭhaka, at the right hand lower corner of the panel, appear to be the Yakṣas who accompanied Siddhartha from the city, sorrowing for his loss. 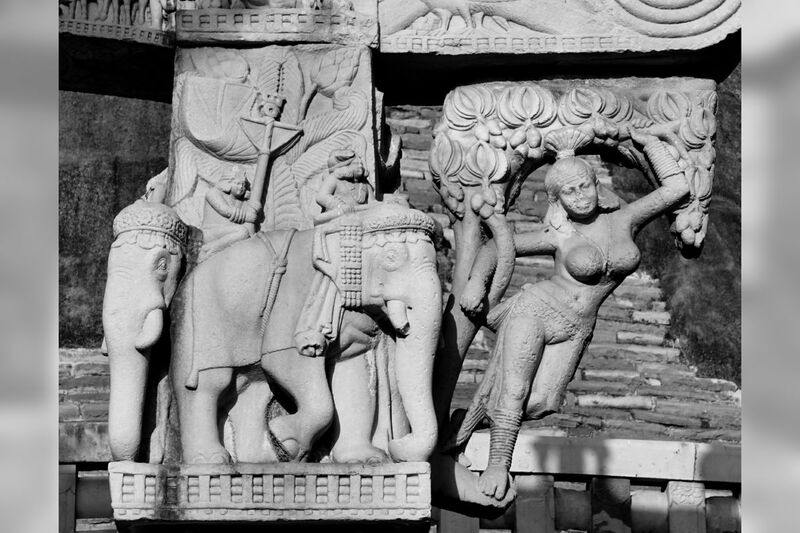 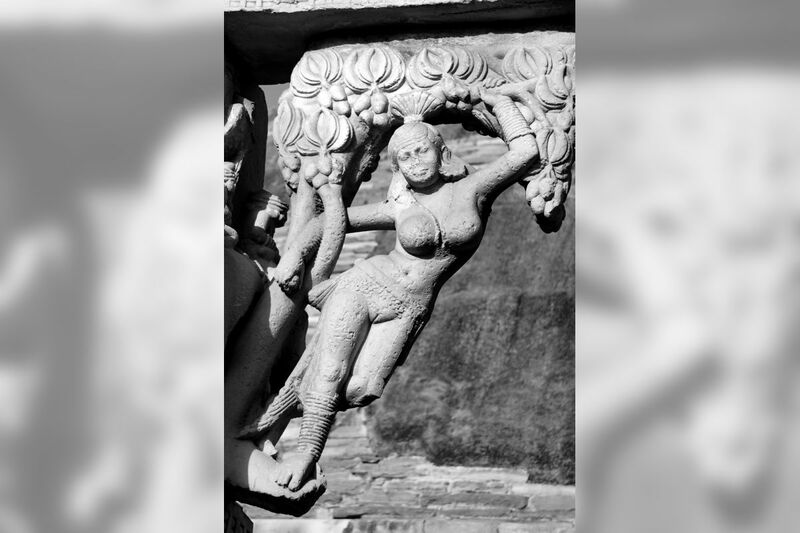 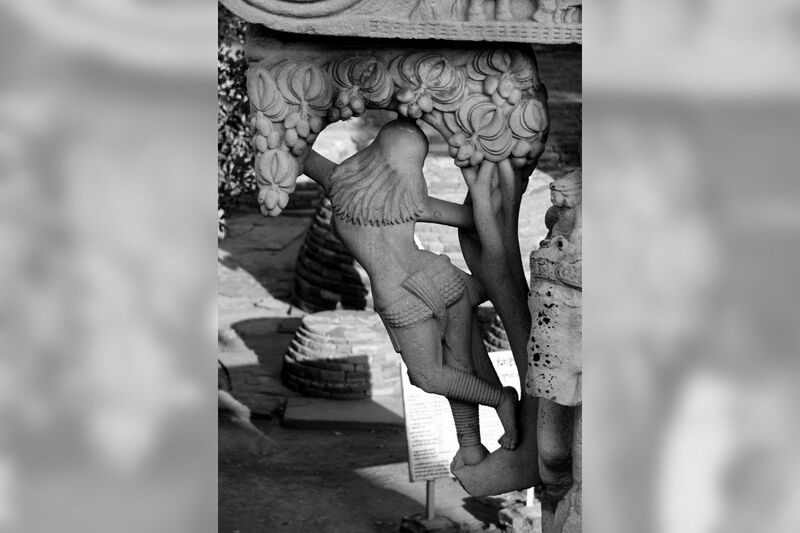 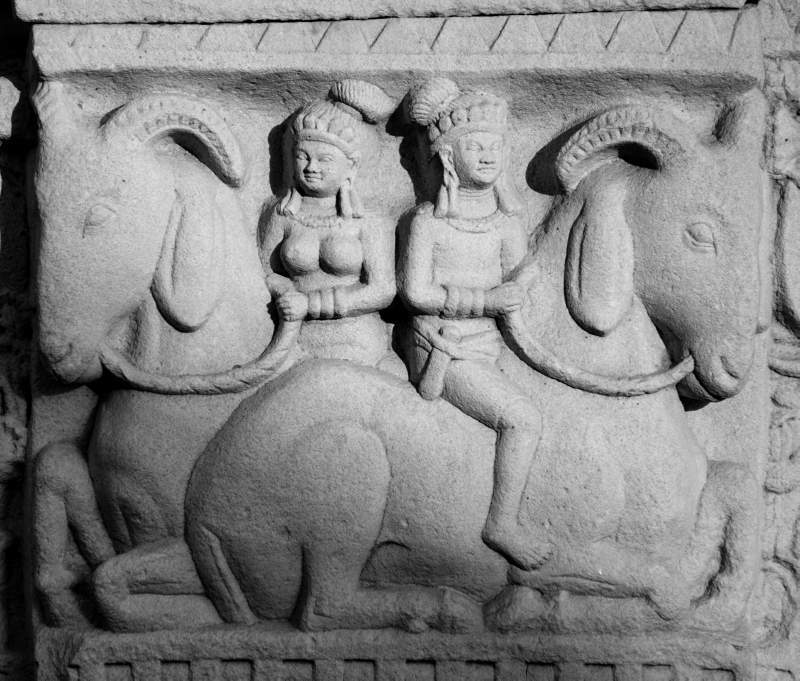 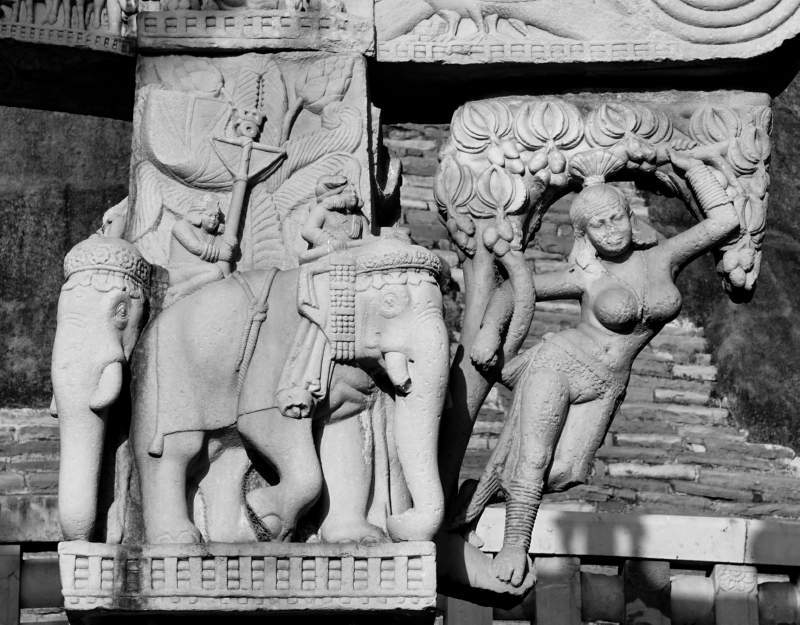 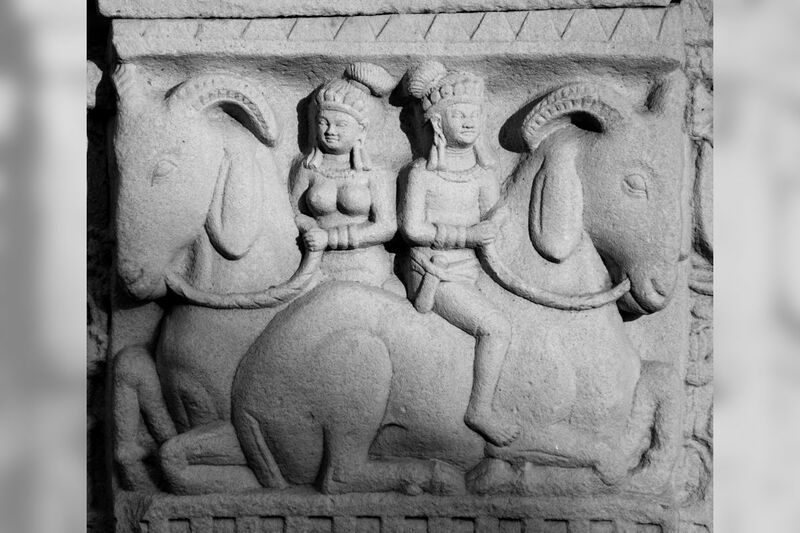 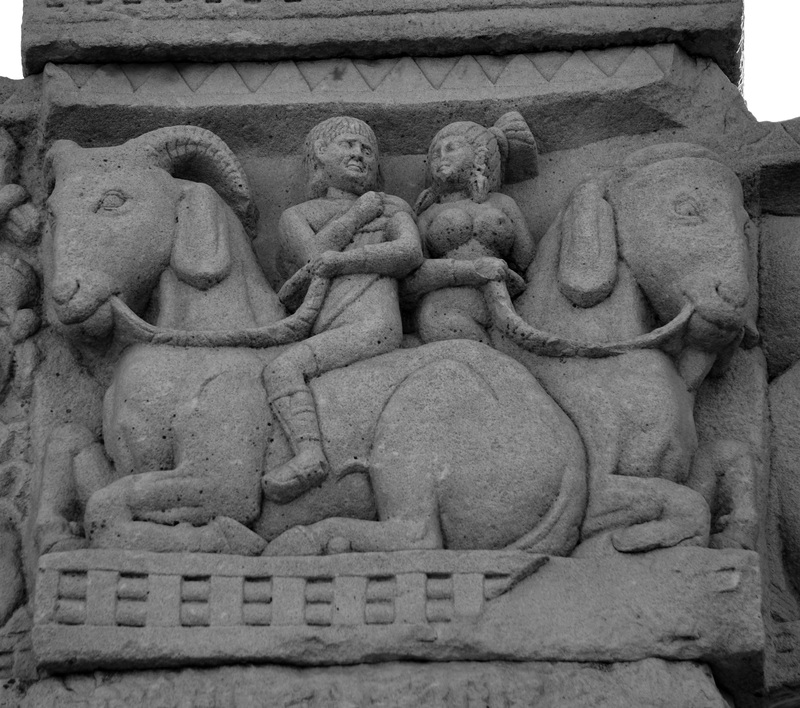 In Gandhāra sculptures, the city goddess herself, portrayed in Hellenistic fashion, is represented sorrowing for the loss of Gautama. 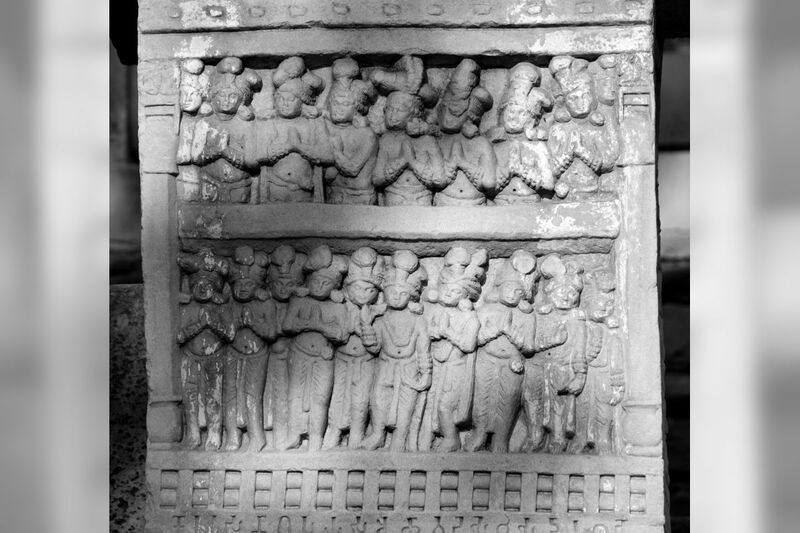 But they might also be the emissaries whom king Śuddhodana sent to bring back his son. 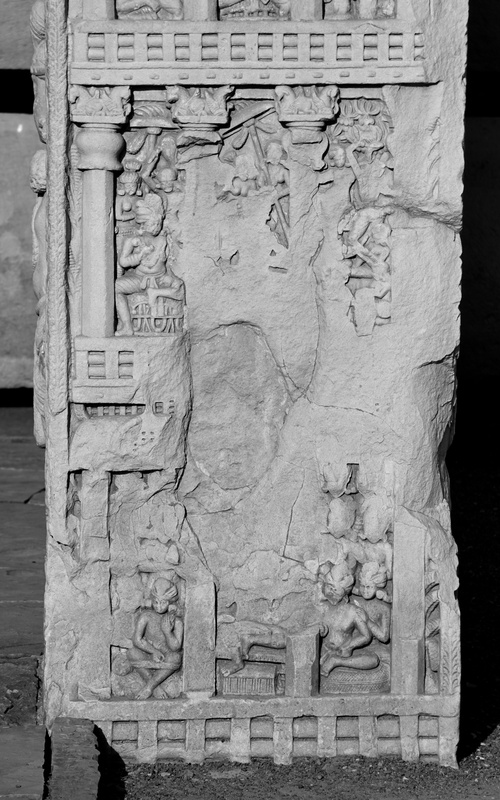 In the middle of the panel is a jambu tree (eugenia jambu), placed there by the sculptor, apparently as a reminder of the first meditation of the Bodhisattva and the path on which it subsequently led him. 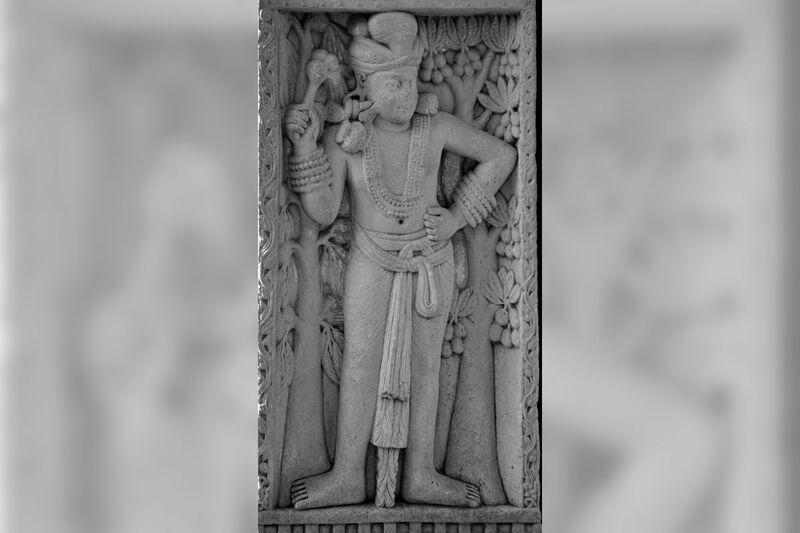 This meditation, it will be remembered, took place beneath a jambu tree, the shade of which moved not while he sat beneath it. 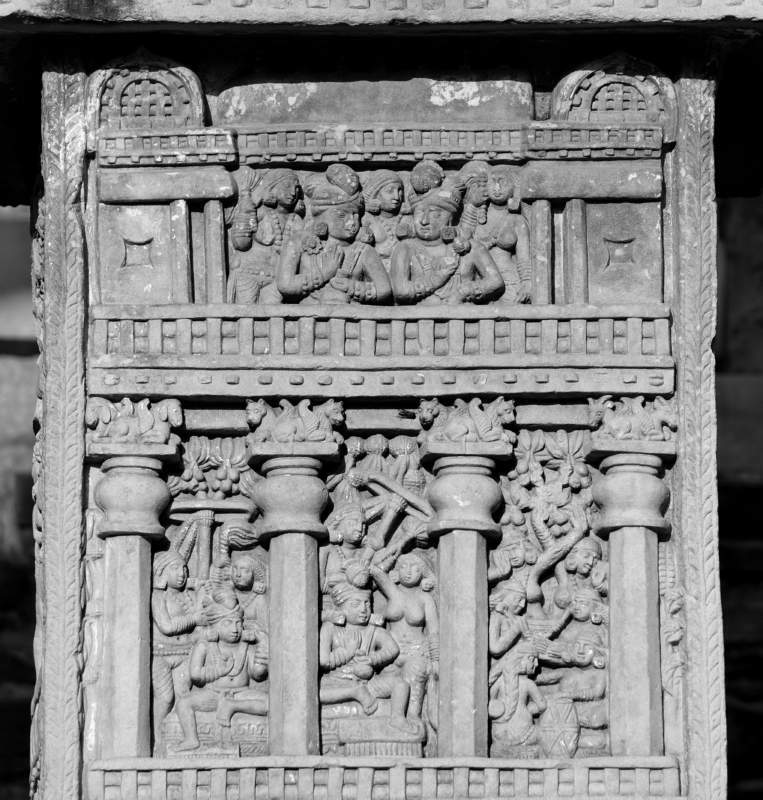 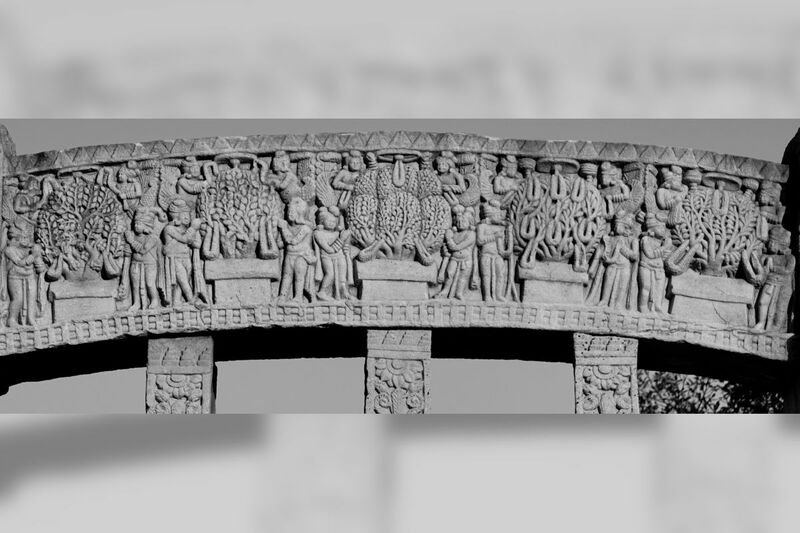 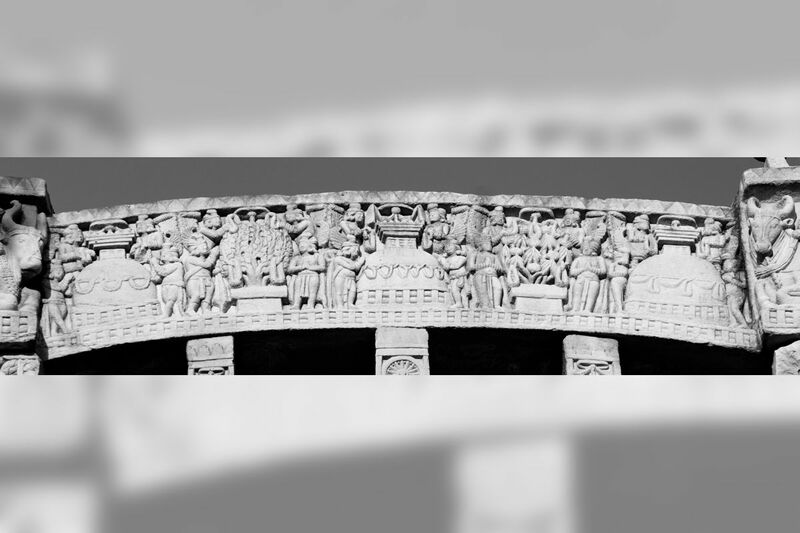 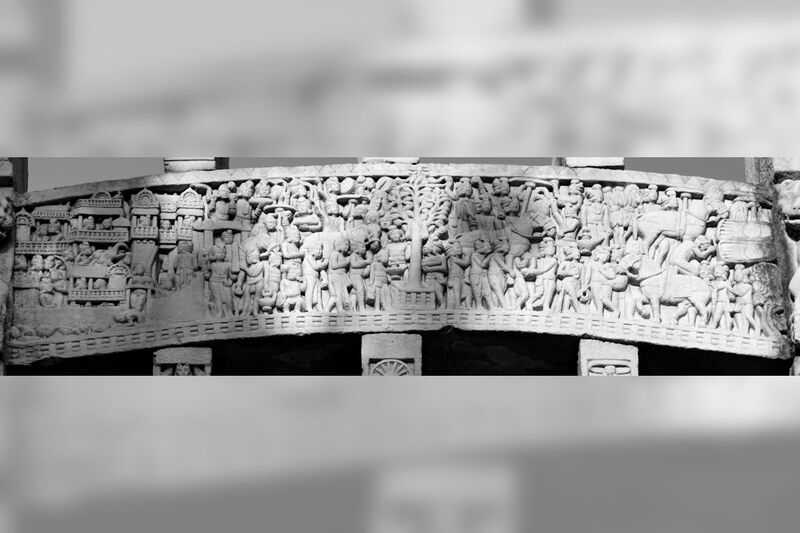 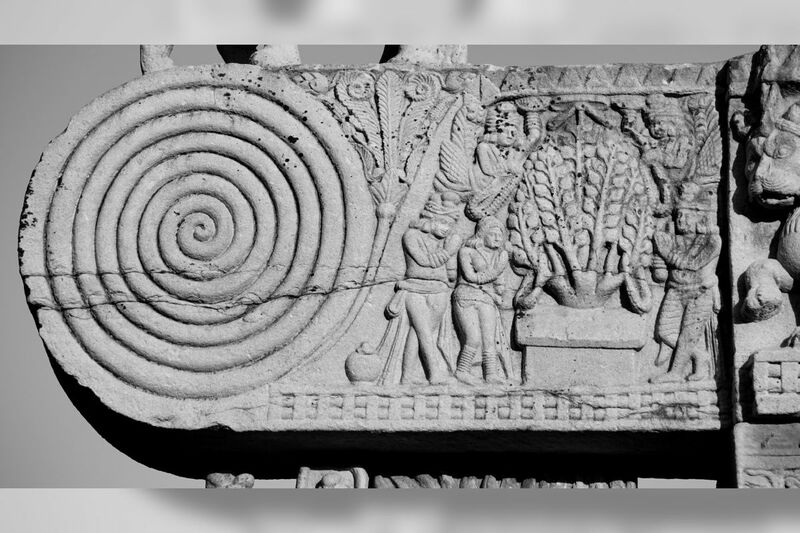 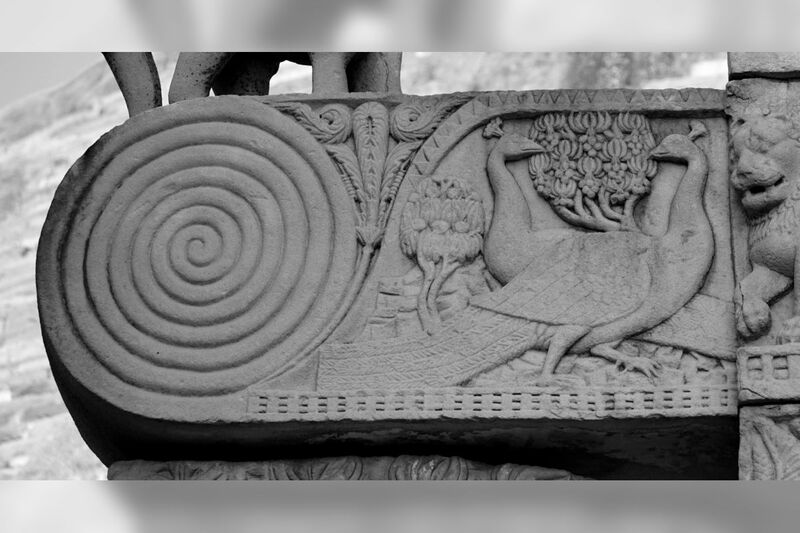 Lowest Architrave – Visit of Aśoka to the Bodhi tree. 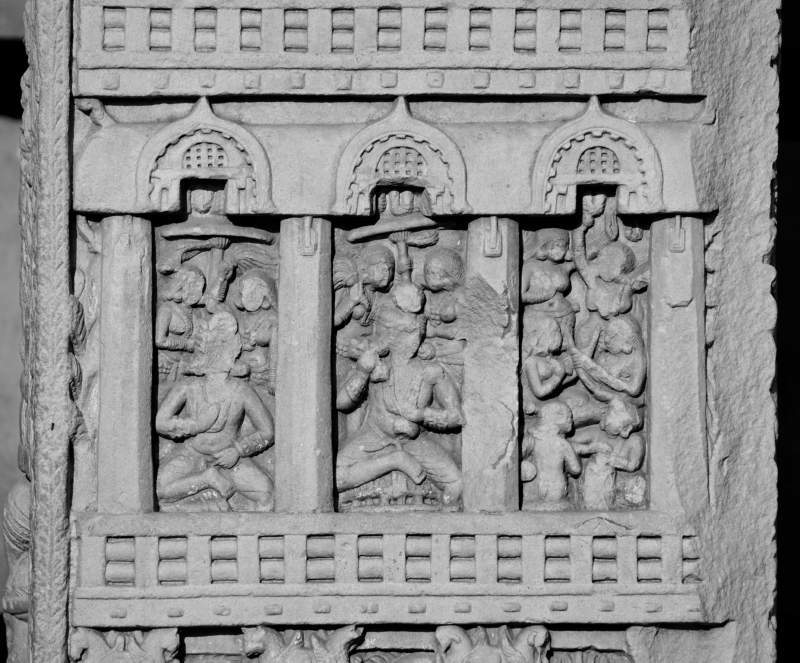 In the centre, the temple and tree of Bodh-Gaya; to the left, a crowd of musicians and devotees with water vessels; to the right, a royal retinue and a king and queen descending from an elephant, and afterwards doing worship at the tree. 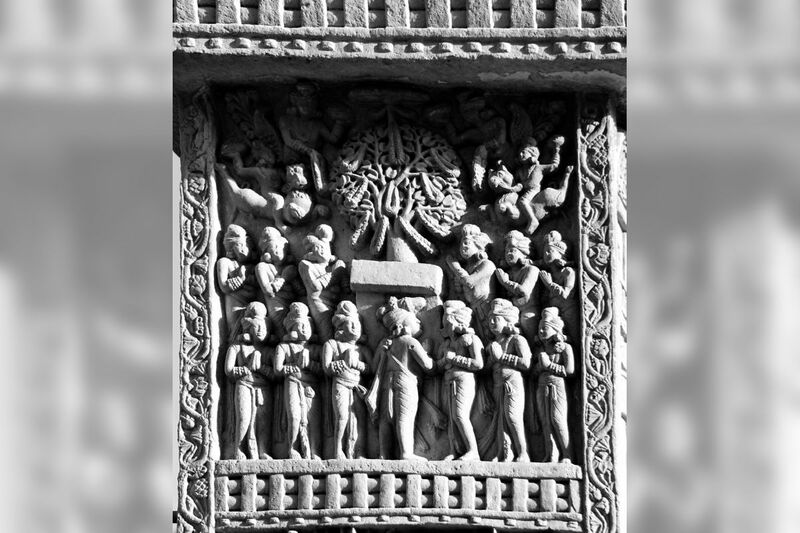 This is the ceremonial visit which Aśoka and his queen Tiṣyarakṣitā paid to the Bodhi tree, for the purpose of watering it and restoring its pristine beauty after the evil spell which the queen in a fit of jealousy had cast upon it. 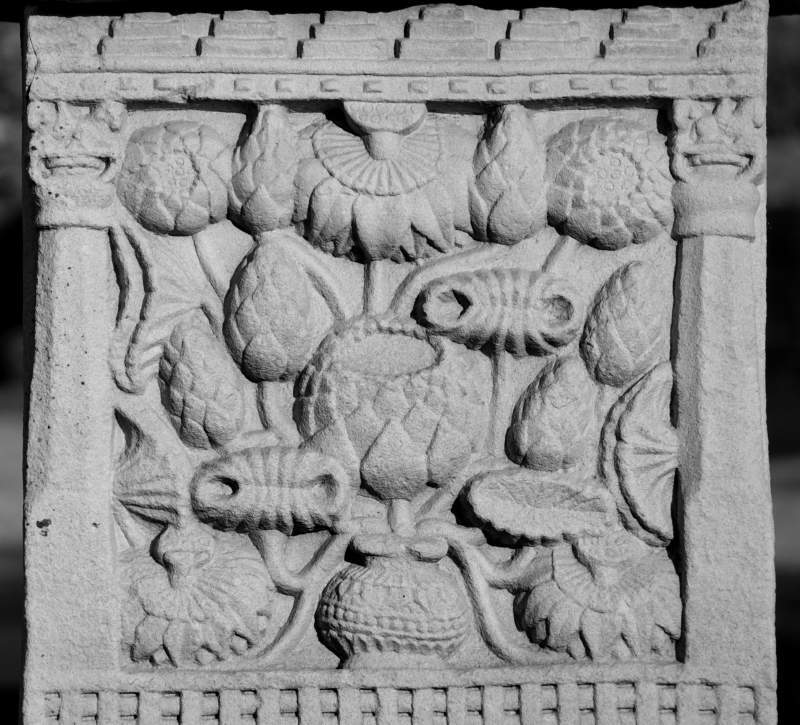 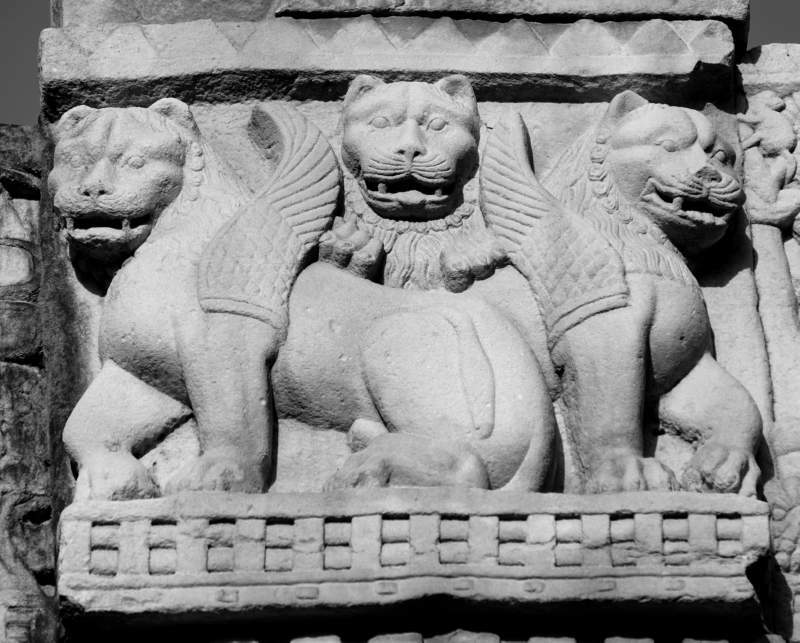 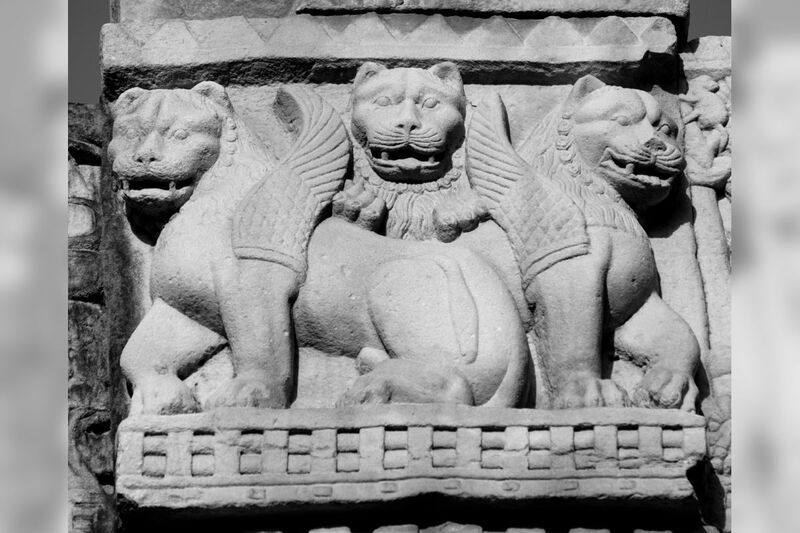 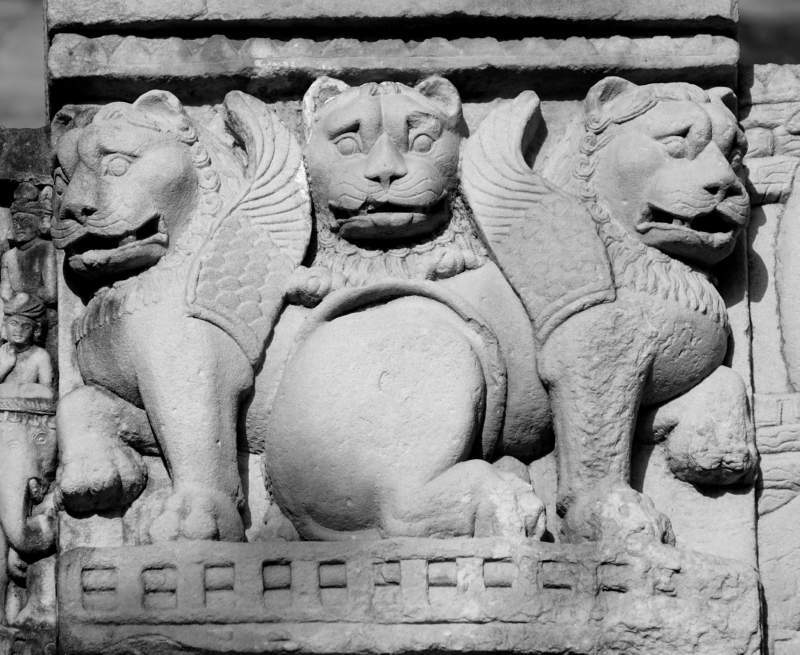 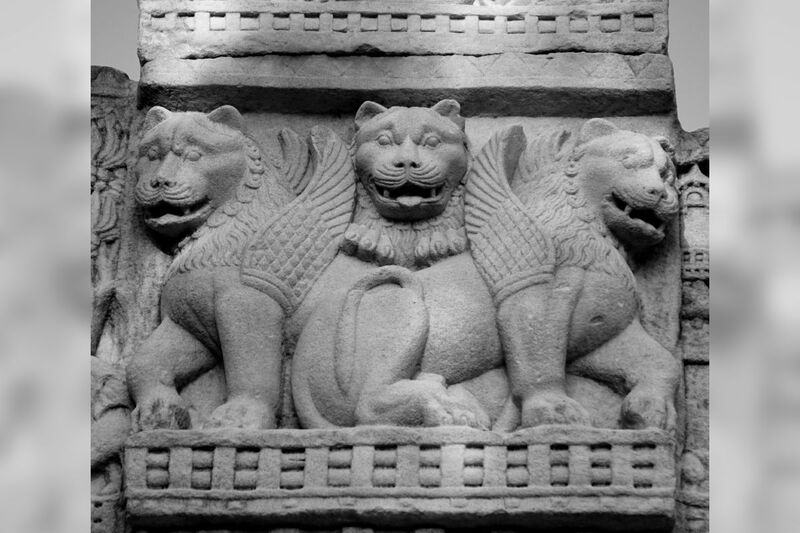 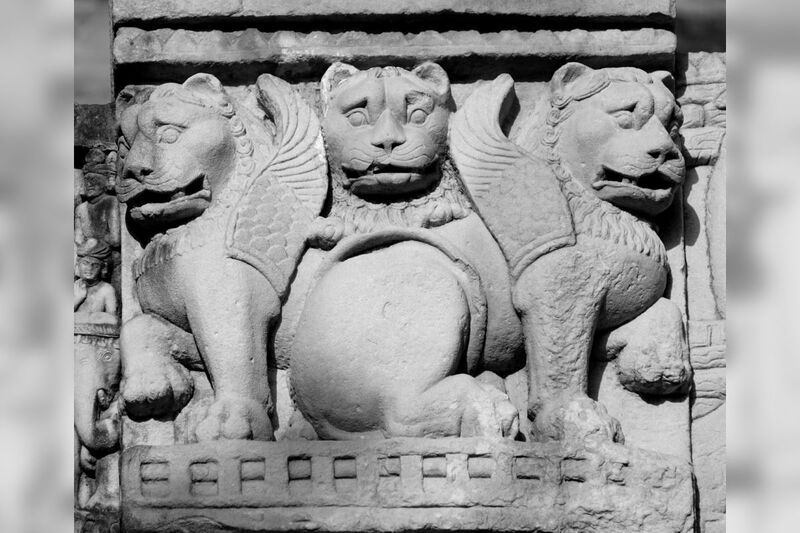 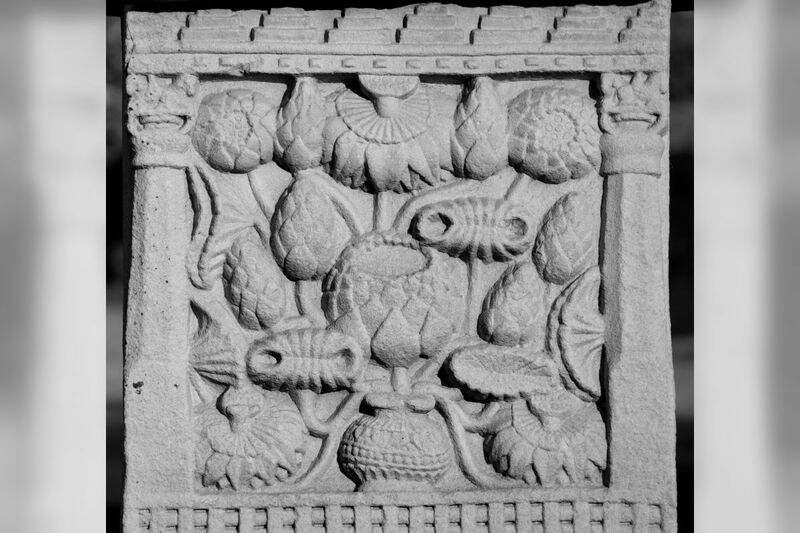 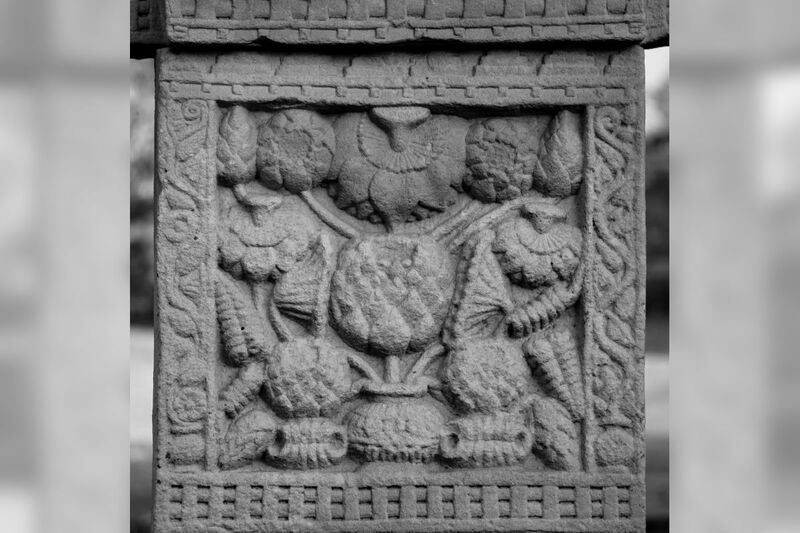 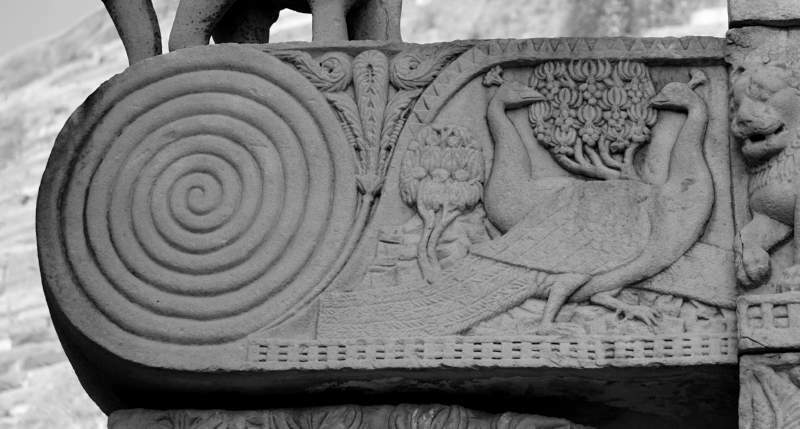 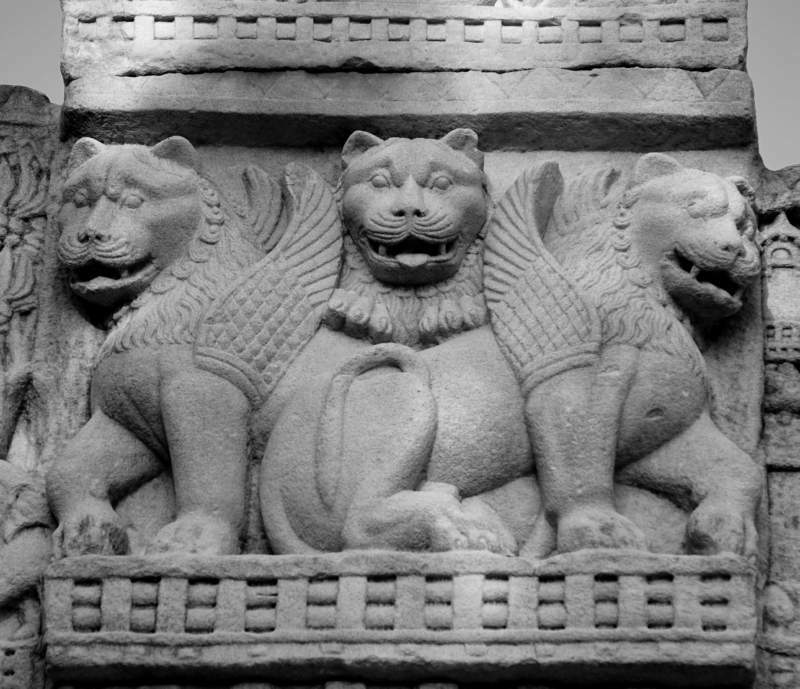 In the pairs of peacocks at the ends of this architrave (see below) there may be a special allusion to Aśoka, since the peacock (Pali = Mora; Sanskrit= Mayūra) was the badge of the Maurya dynasty. 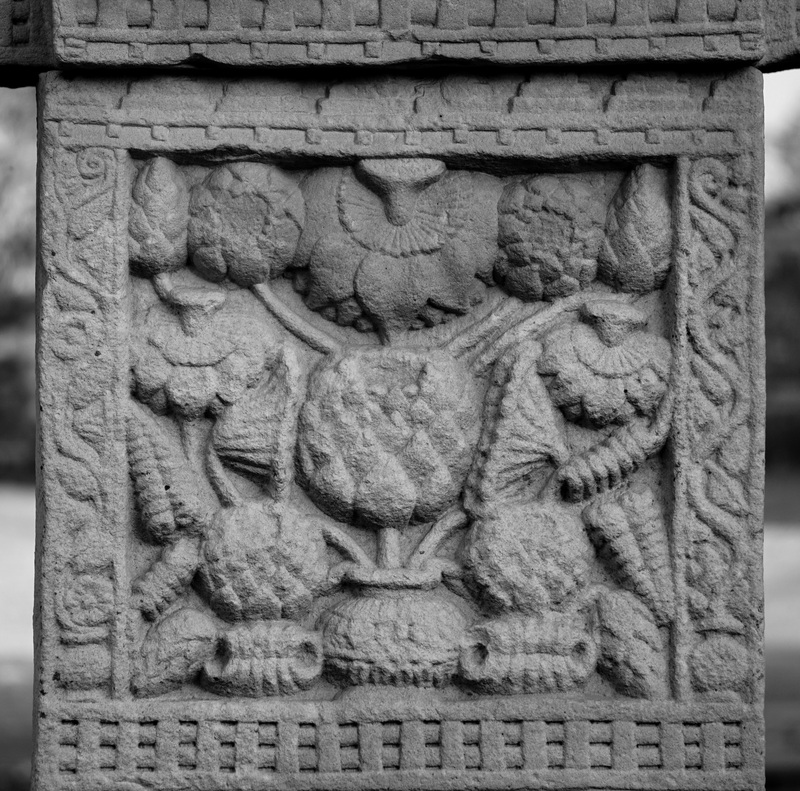 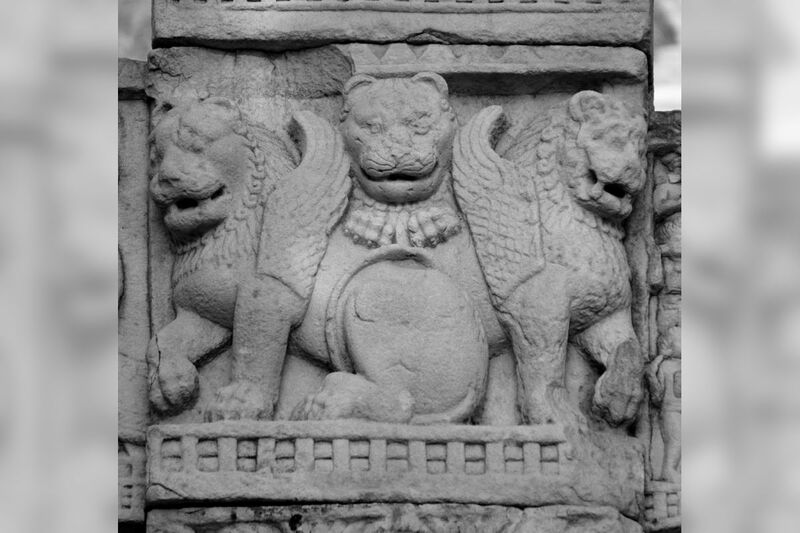 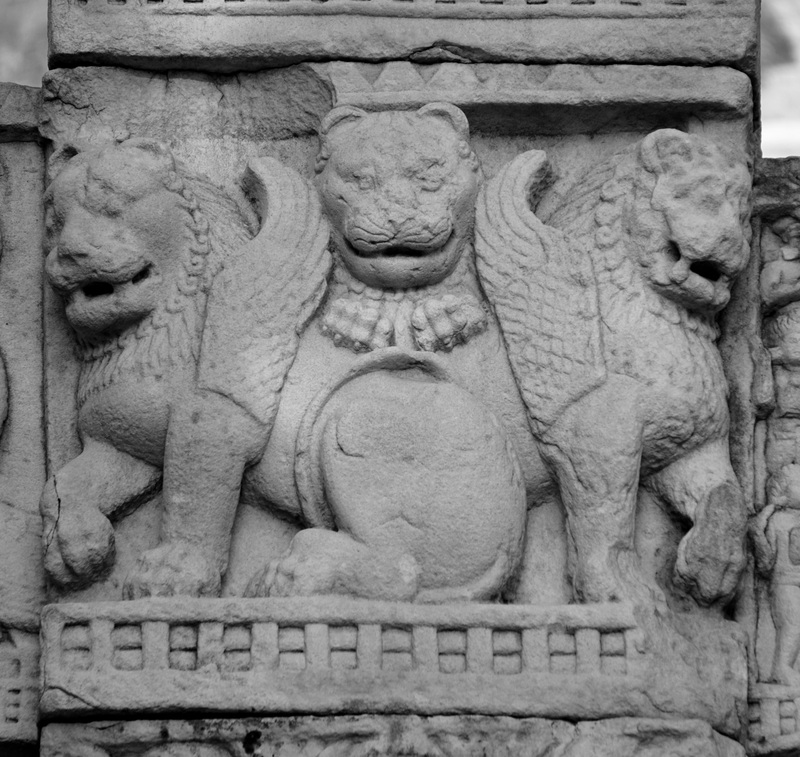 Left Pillar : Front Face. In the second panel from the top is the temple at Bodh-Gaya, built by Aśoka, with the throne of Buddha within, and, spreading through its upper windows, the branches of the sacred tree. 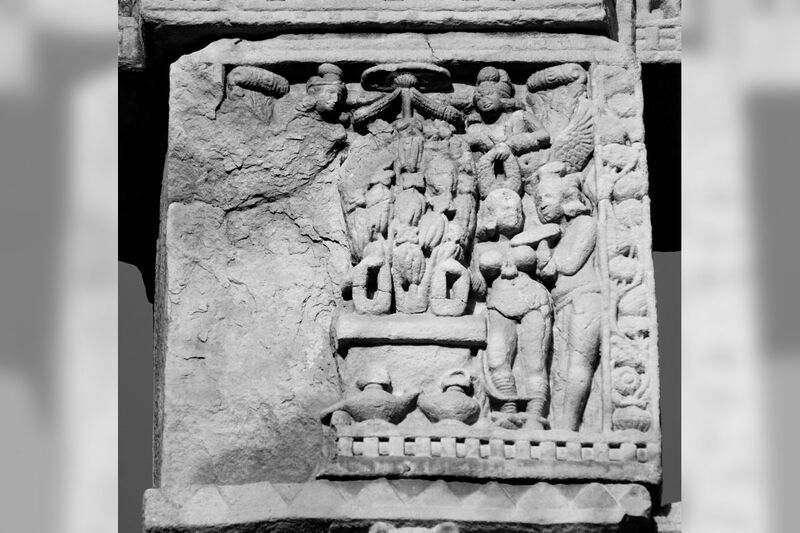 It is the illumination of Buddha and to right and left of the temple are four figures in an attitude of adoration, perhaps the Guardian Kings of the Four Quarters (Lokapālas) ; while ranged above in two tiers are groups of deities looking on from their celestial paradises. 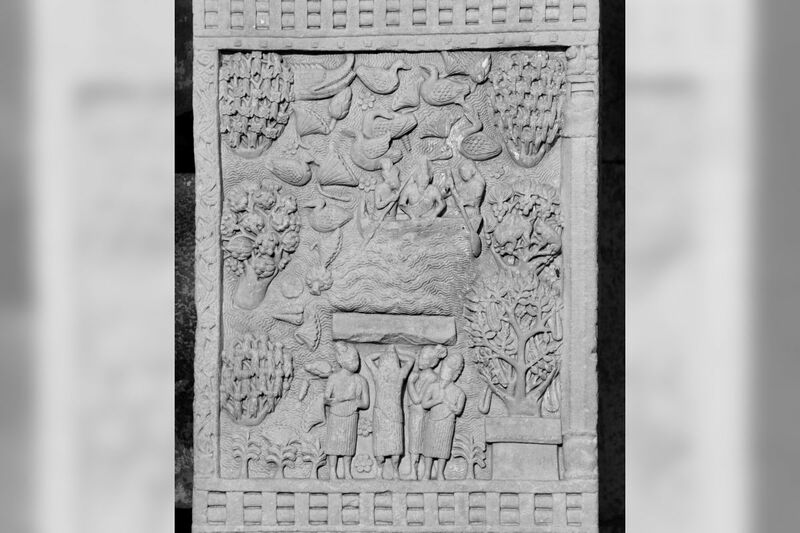 Third Panel – The miracle of the Buddha walking on the waters. The Nairañjanā river is shown in flood and Kāśyapa accompanied by a disciple and a boatman hastening in a boat to the rescue of Buddha. 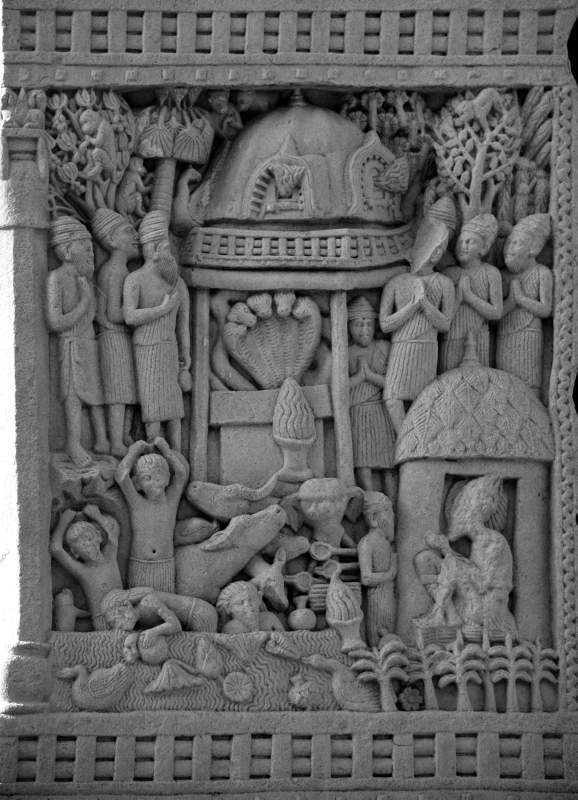 Then, in the lower part of the picture, Buddha, represented by his promenade (cankrama), appears walking on the face of the waters, and in the foreground the figures of Kāśyapa and his disciple are twice repeated, now on dry ground and doing homage to the Master (represented by the throne at the right hand, bottom corner). 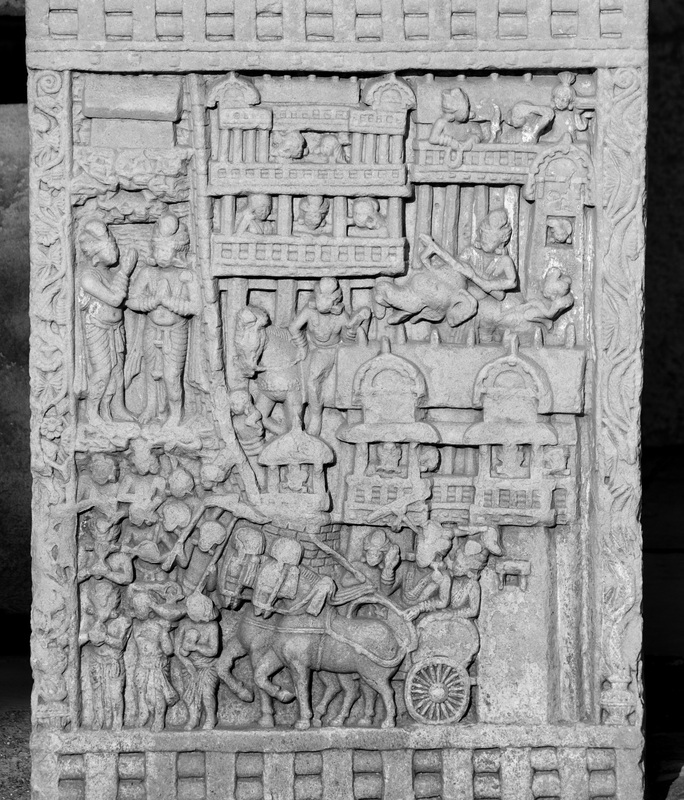 Lowest Panel – Bimbisāra with his royal cortege issuing from the city of Rājagriha, on a visit to the Buddha, here symbolised by his empty throne. This visit took place after the conversion of Kāśyapa, which was brought about by a series of miracles, one of which is illustrated in the panel above. 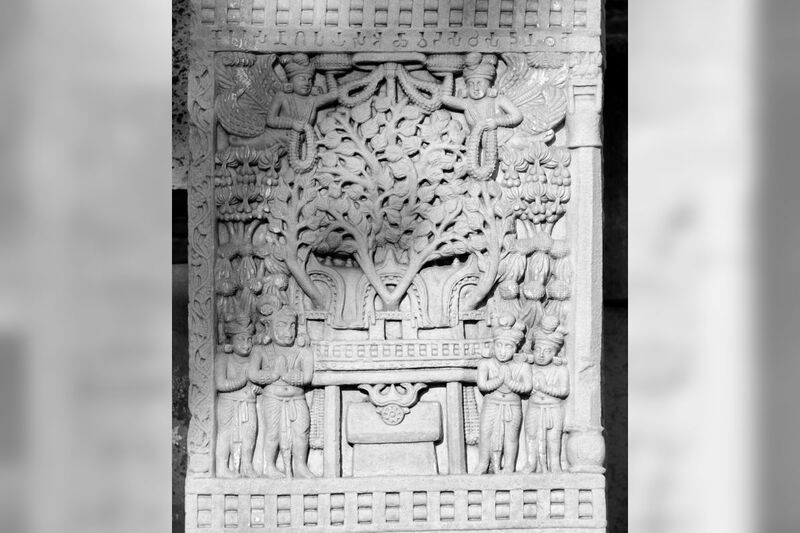 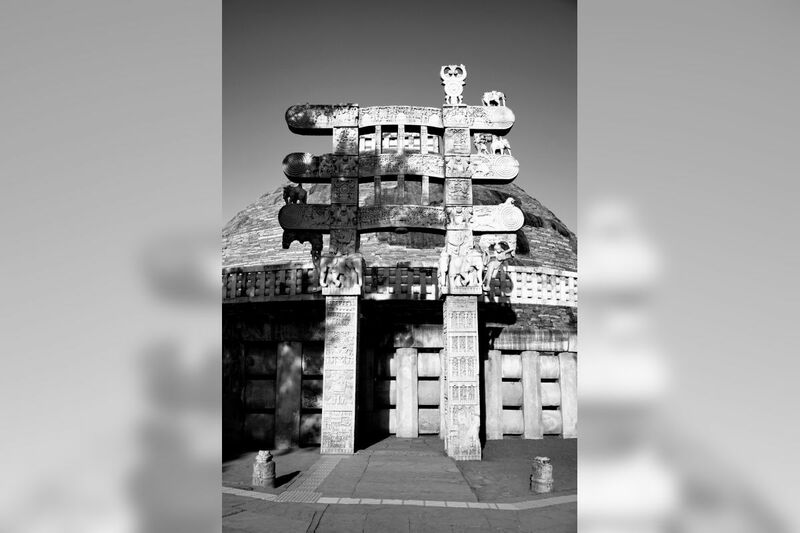 Top Architrave – The seven last Buddhas, represented by their thrones and the Bodhi trees beneath which they attained enlightenment. 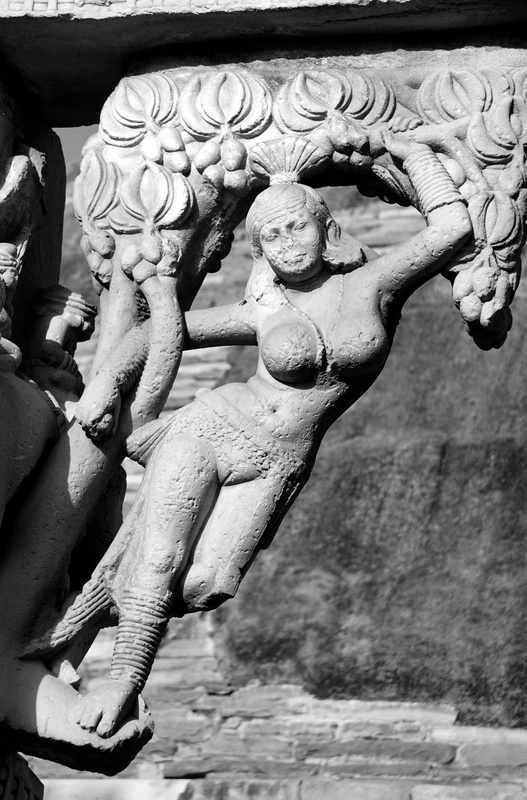 Figures, human and divine, are worshipping them. 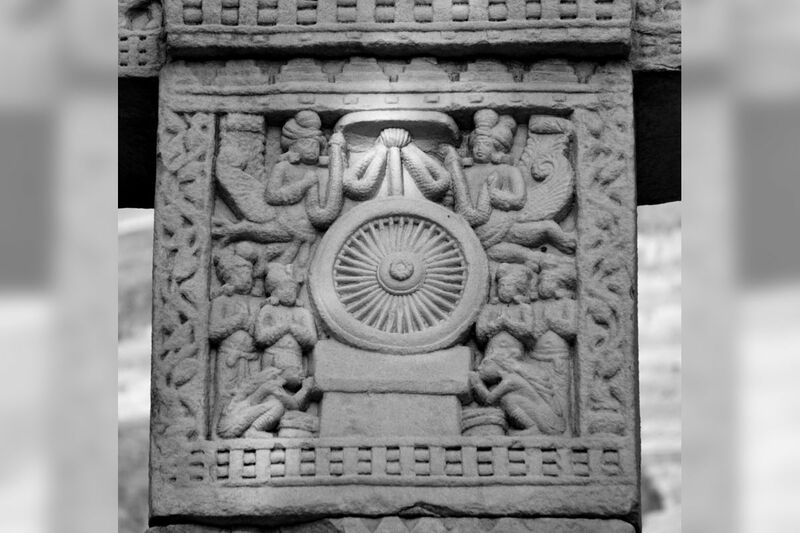 Middle Architrave – The illumination (sambodhi) of the Buddha. 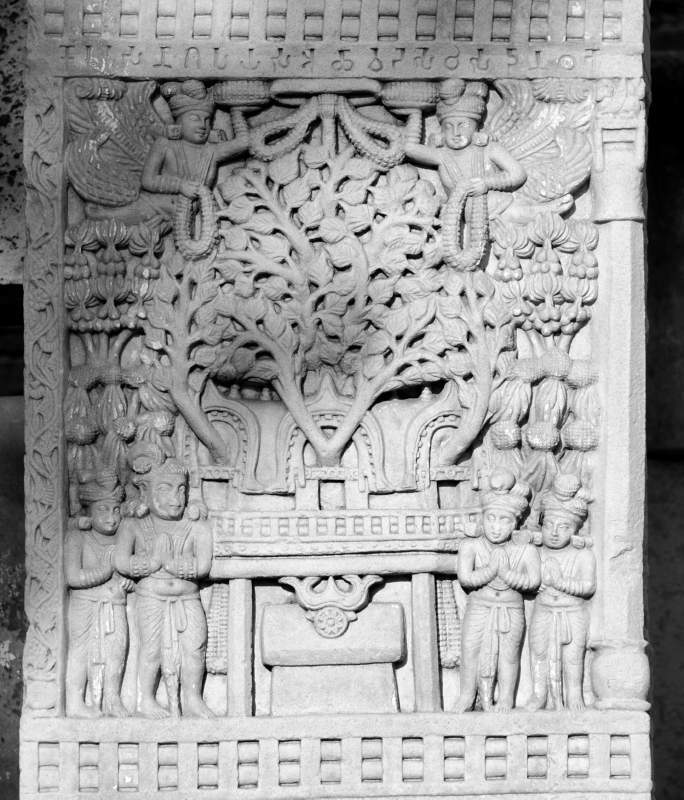 In the centre is his throne, and behind it the pīpal tree at Bodh-Gaya beneath which he sat. 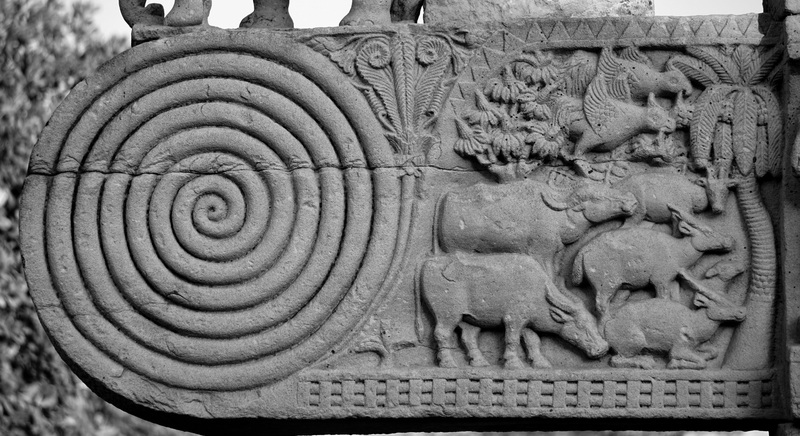 To right and left come animals, real and mythical, birds and Nāgas, symbolising his new won sovereignty over all creatures. 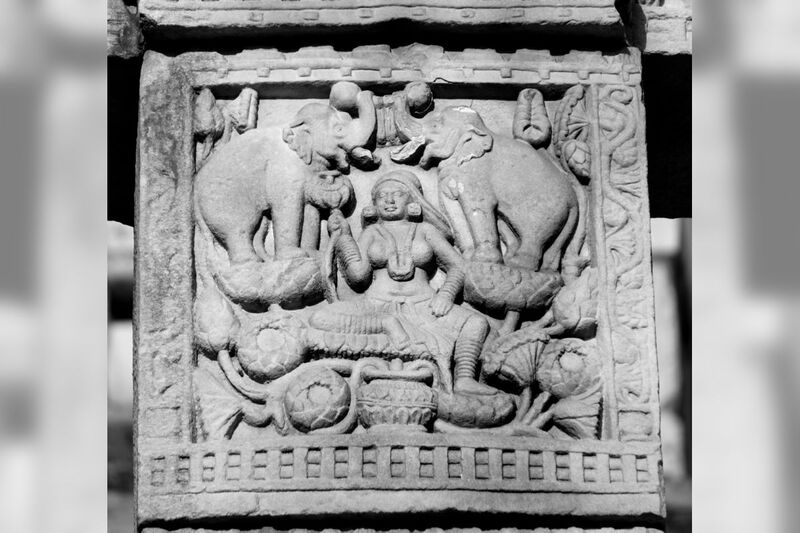 The presence of the Nāga recalls the episode of Mucalinda, the tutelary deity of a lake near Gayā, who, shortly after the Illumination, spread his hood over the Buddha to protect him from the rain. 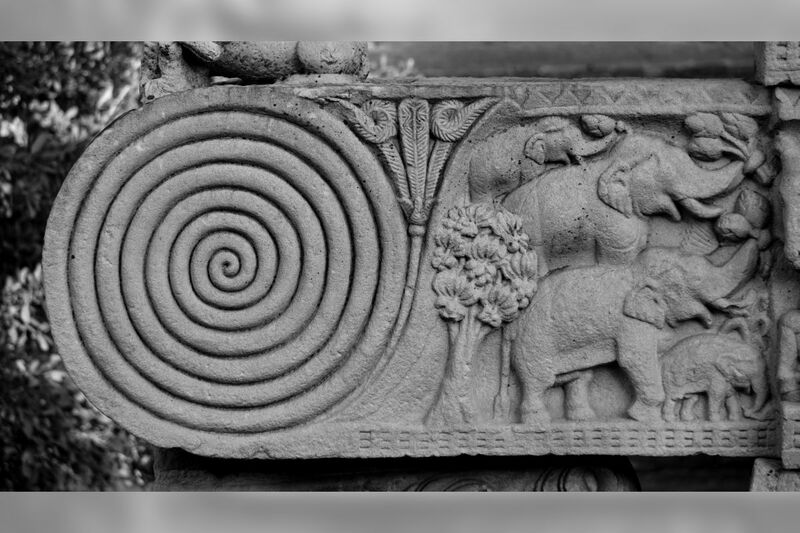 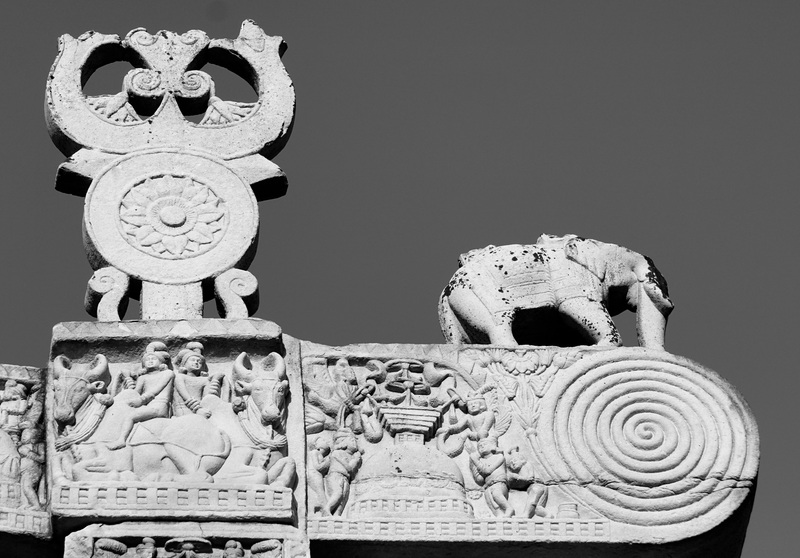 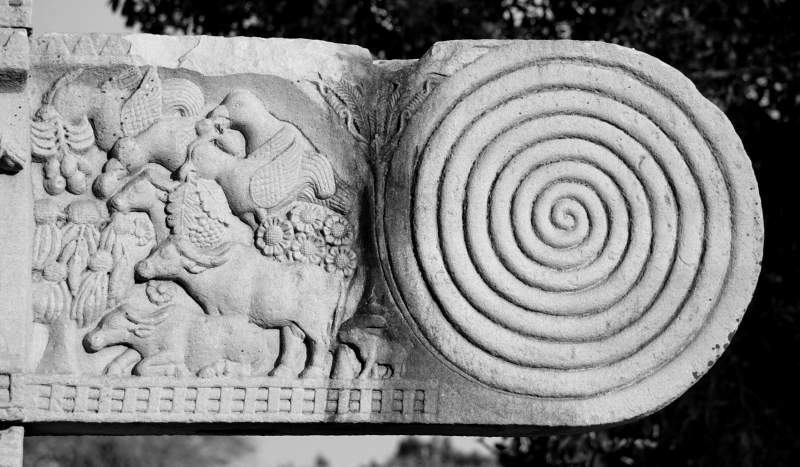 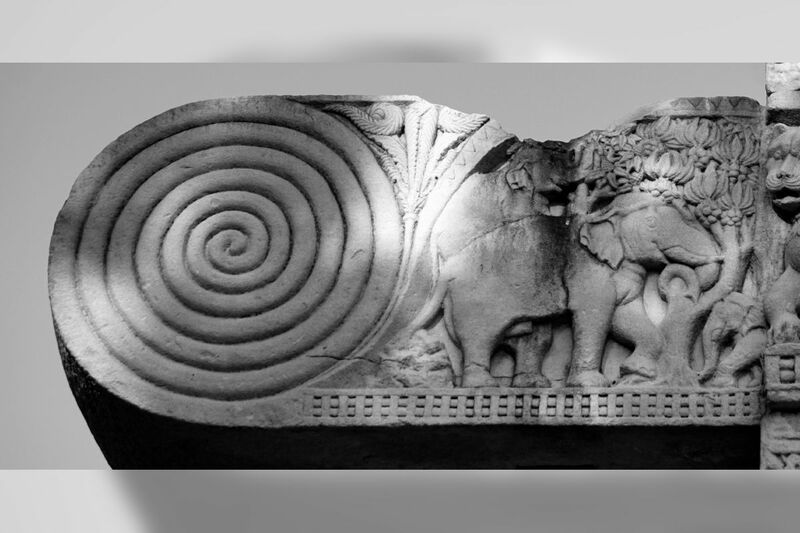 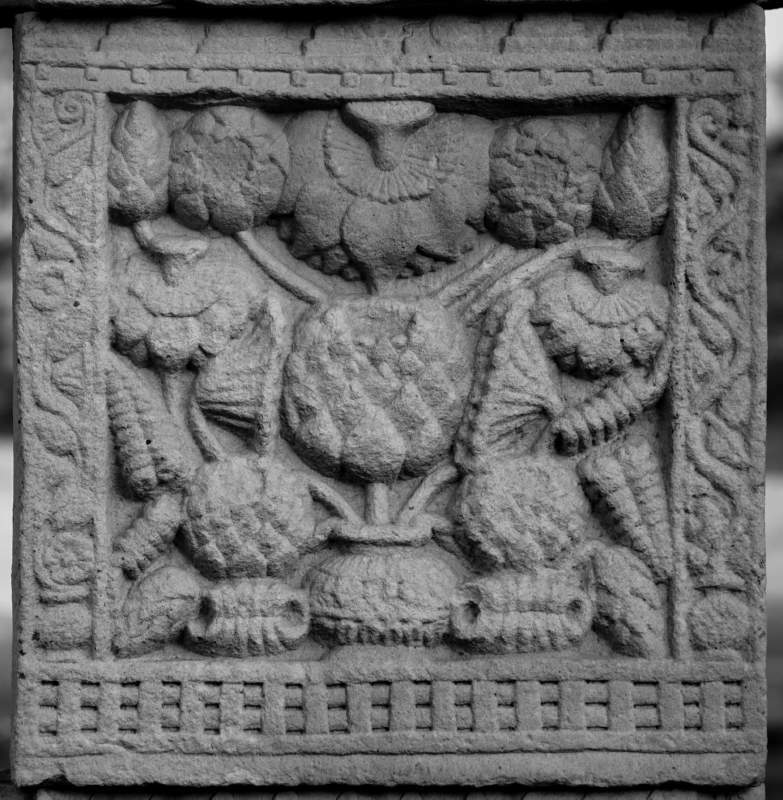 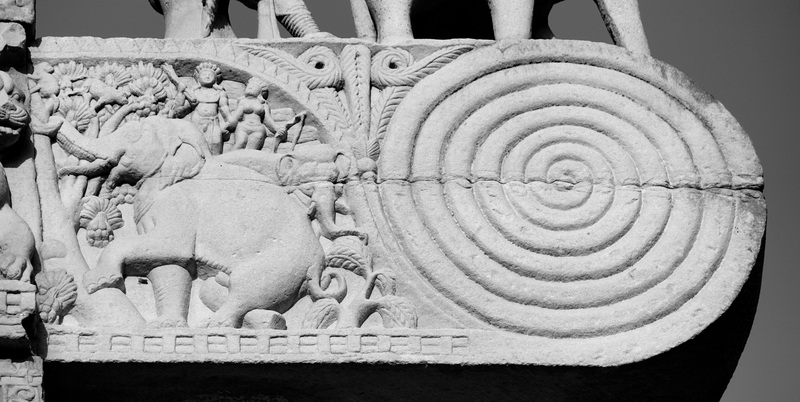 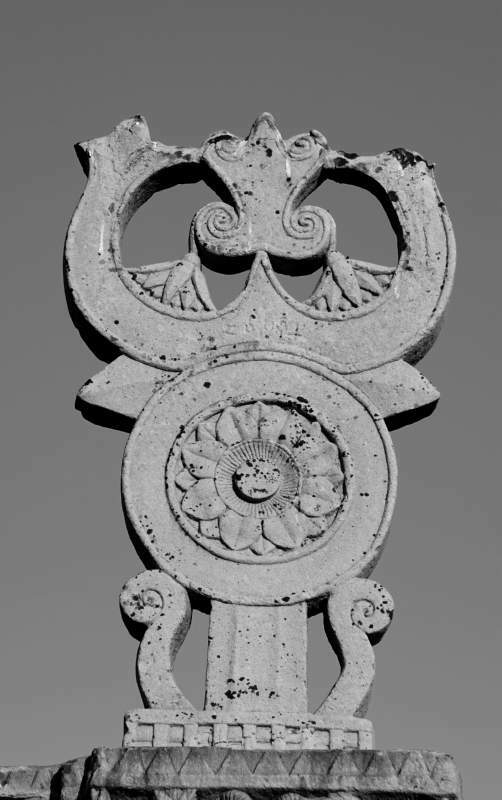 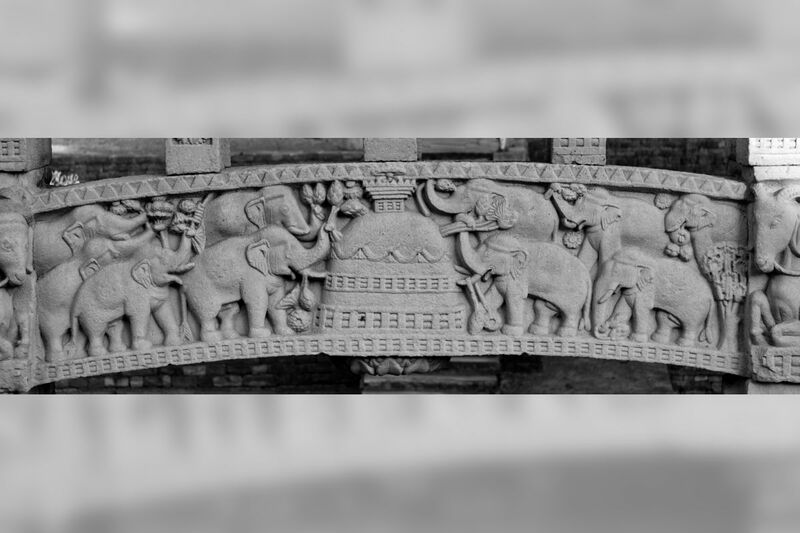 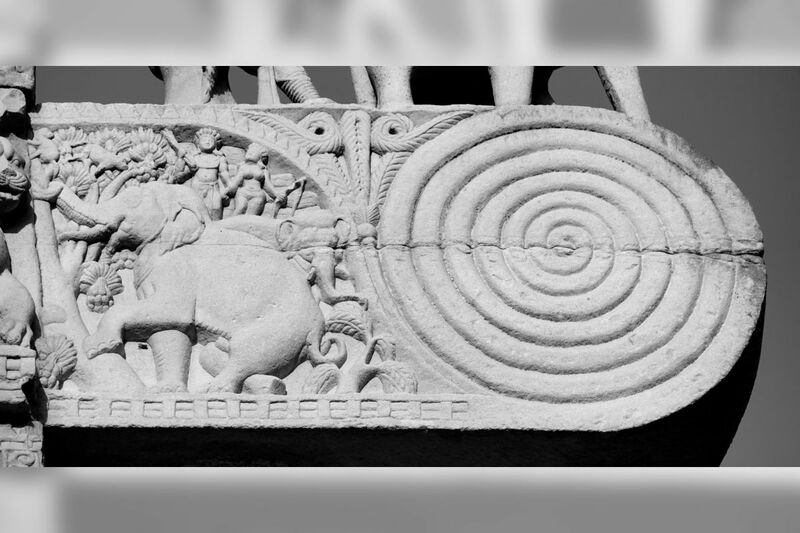 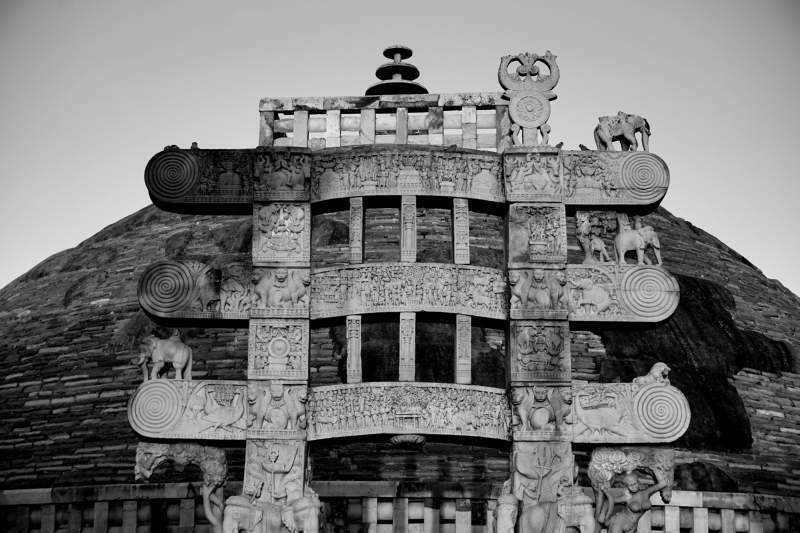 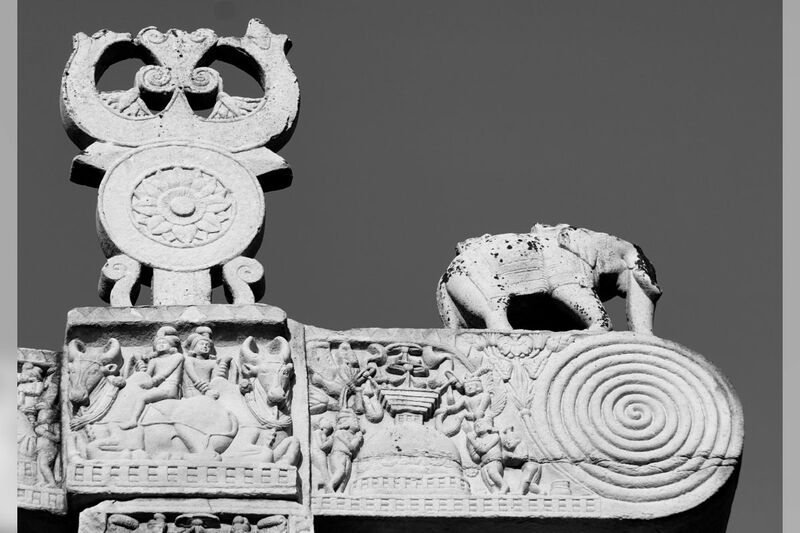 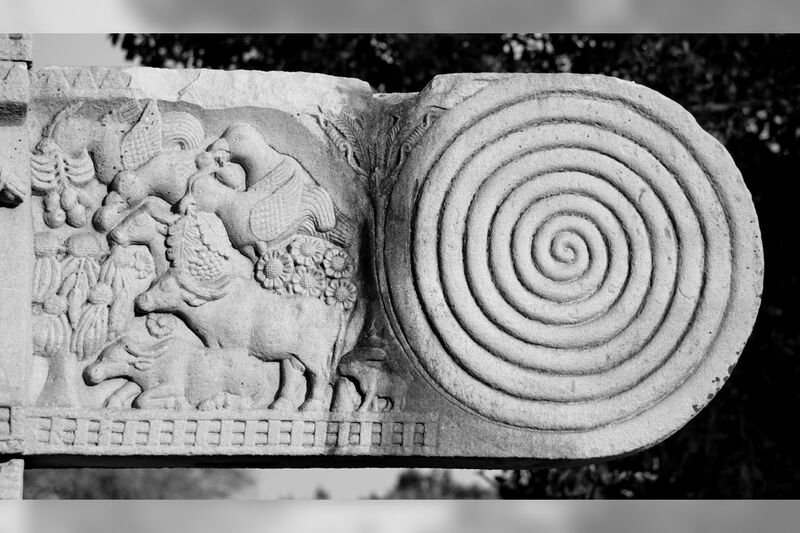 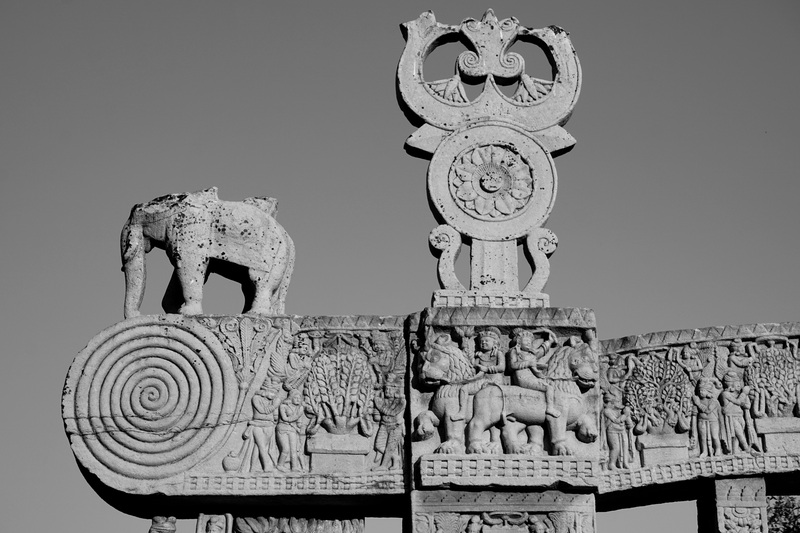 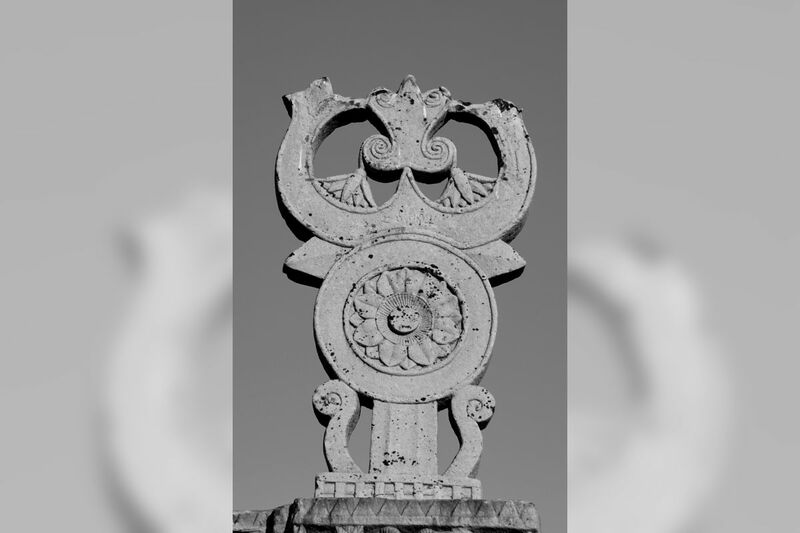 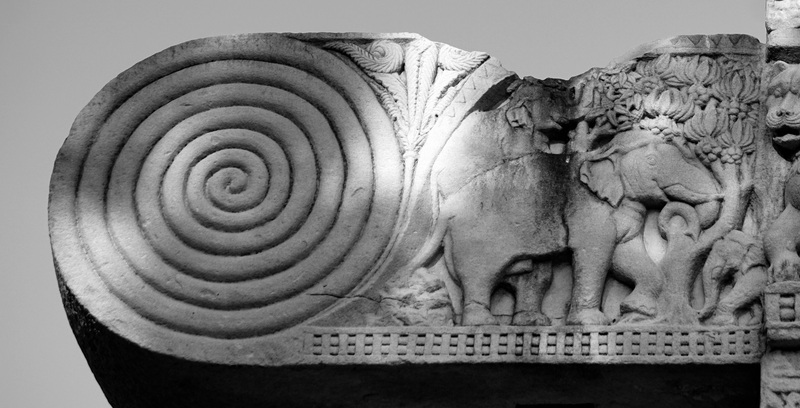 Lowest Architrave – the centre is a stūpa, to which elephants are bringing offerings of flowers and fruit. 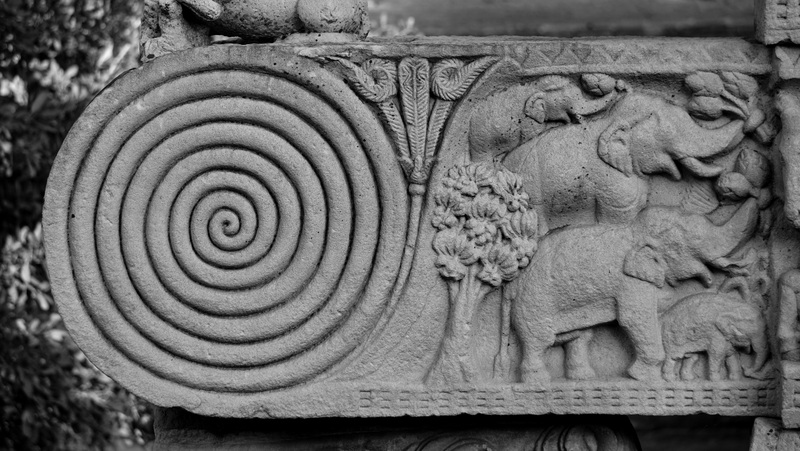 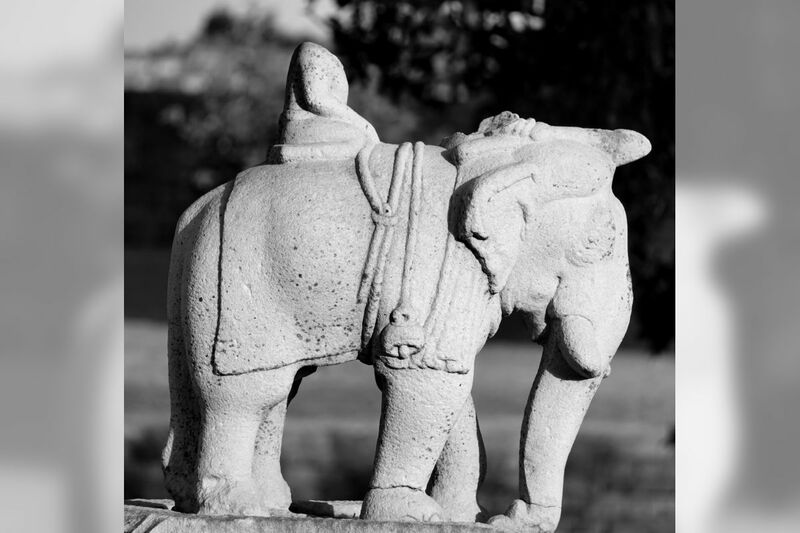 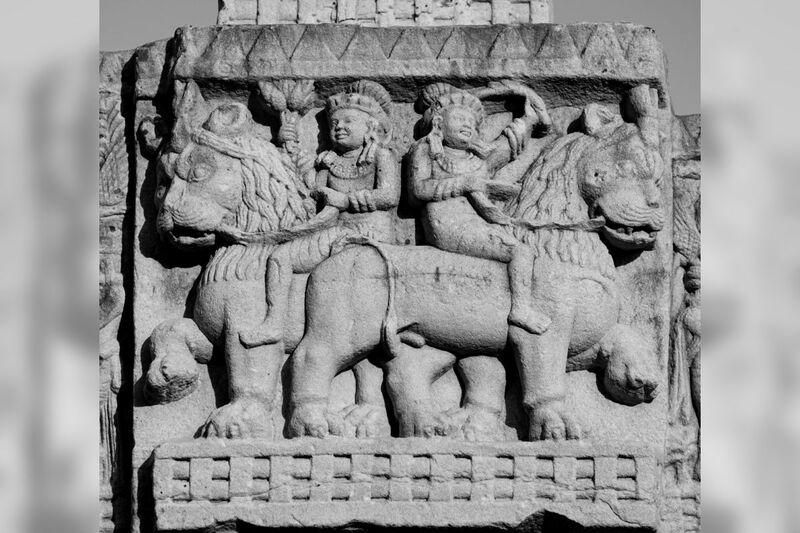 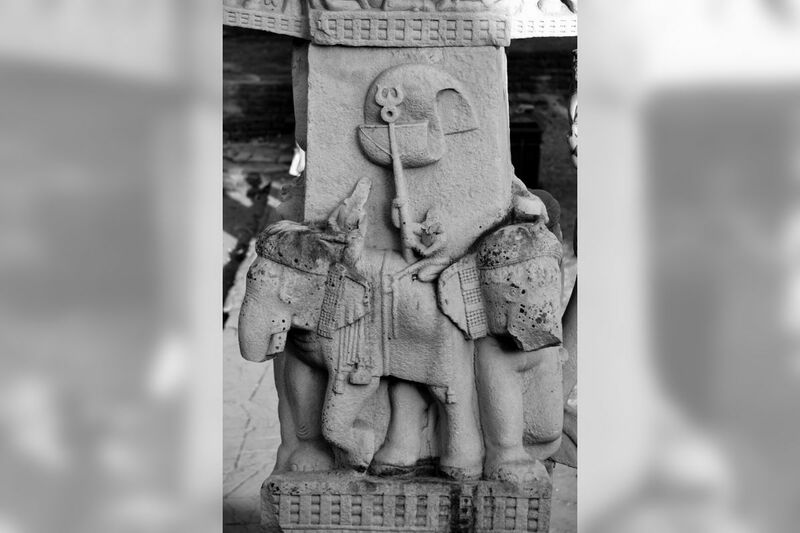 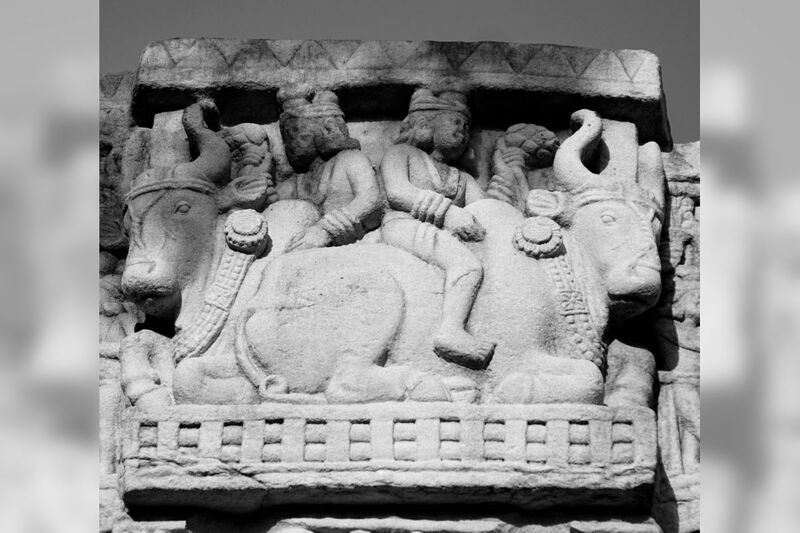 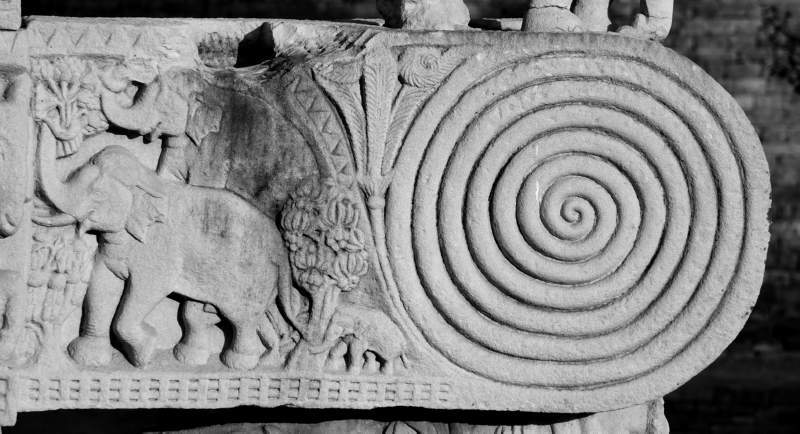 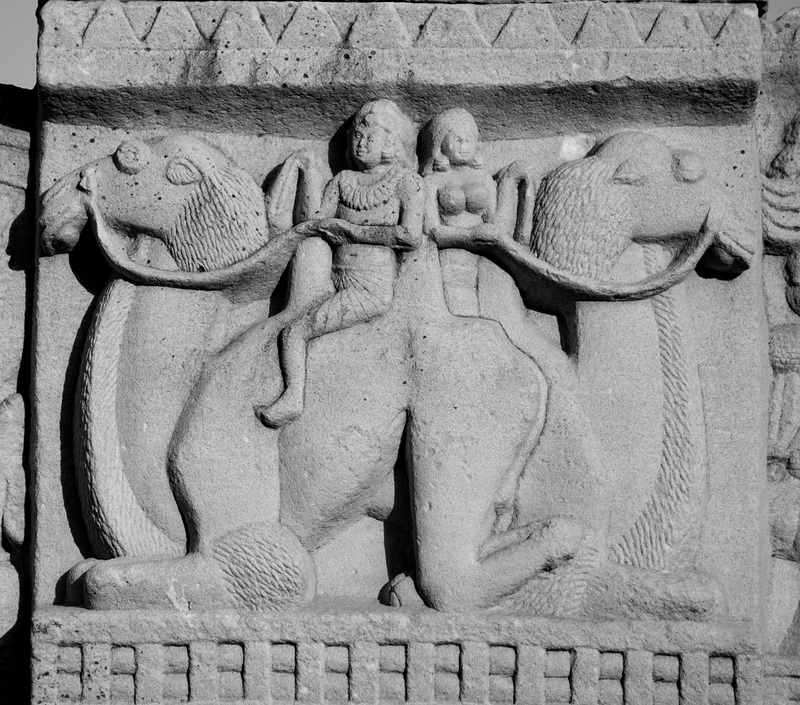 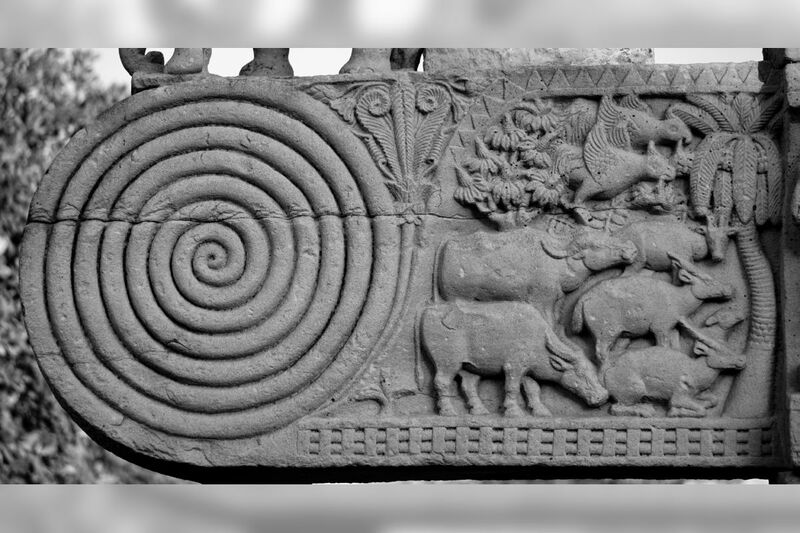 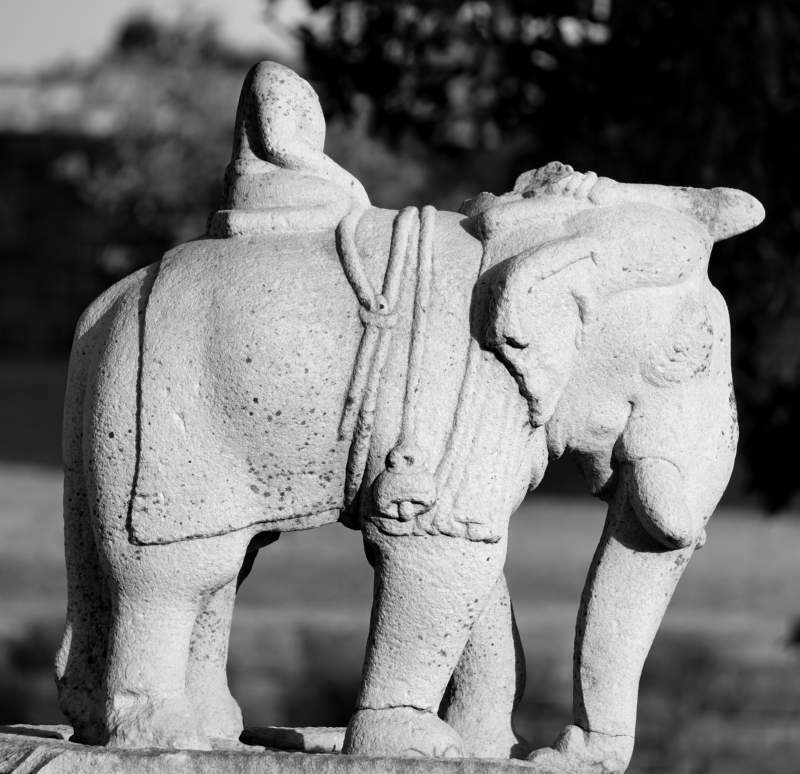 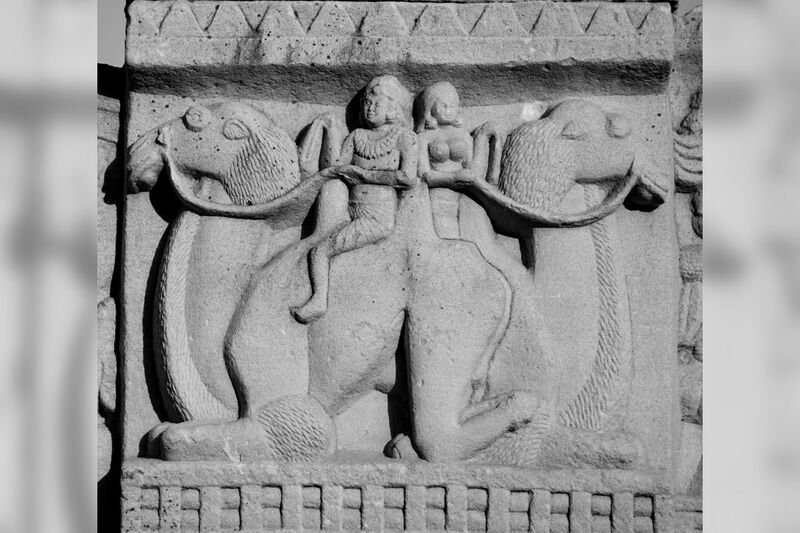 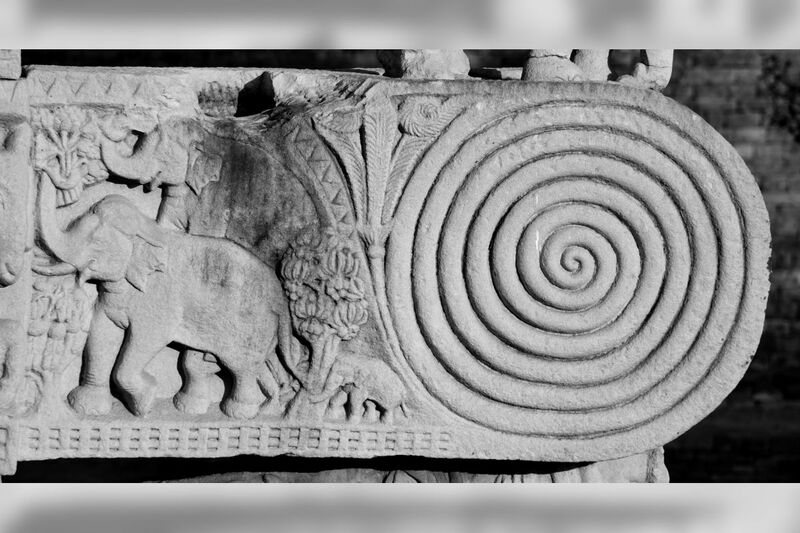 It may be the stūpa of Rāmagrāma, the guardians thereof, who prevented Aśoka removing the relics, being portrayed as elephants. 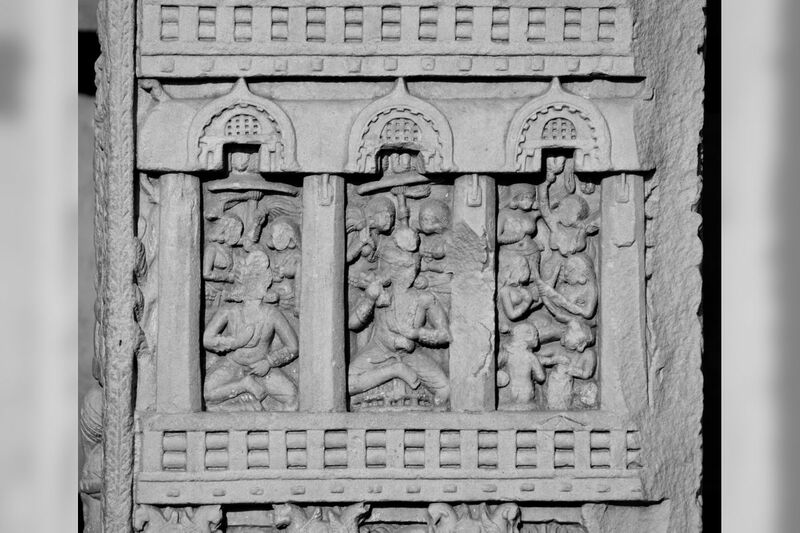 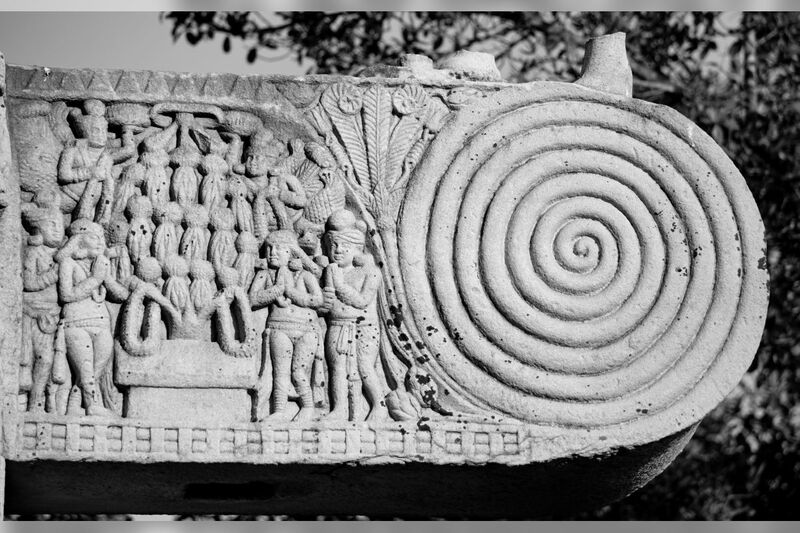 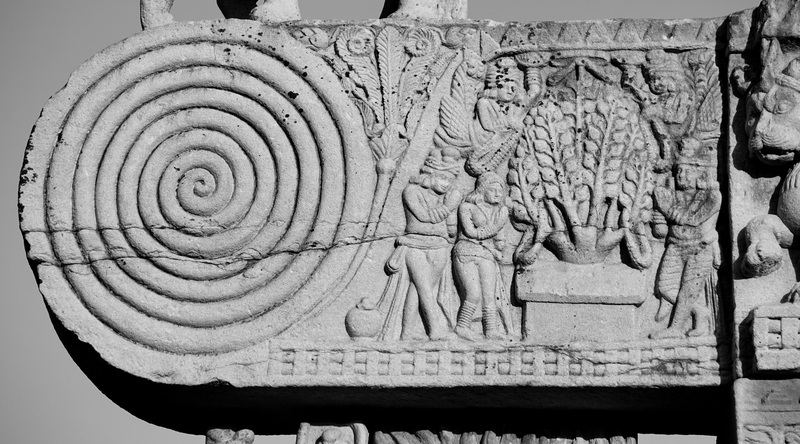 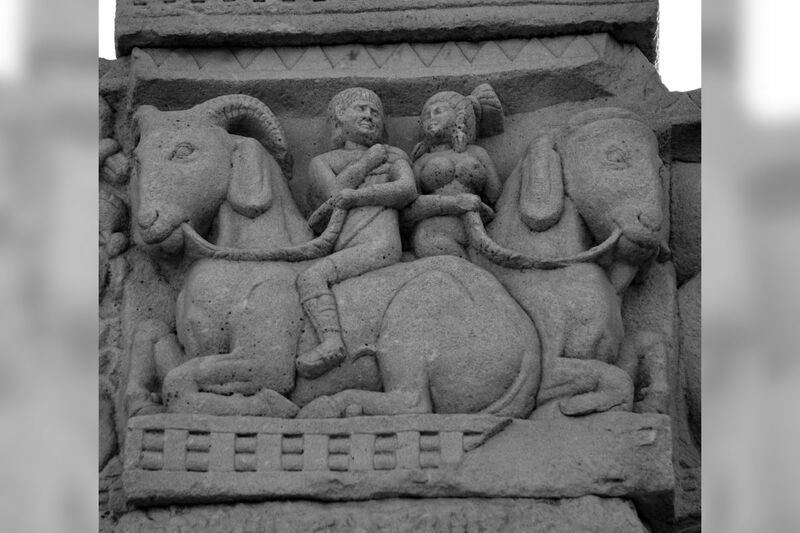 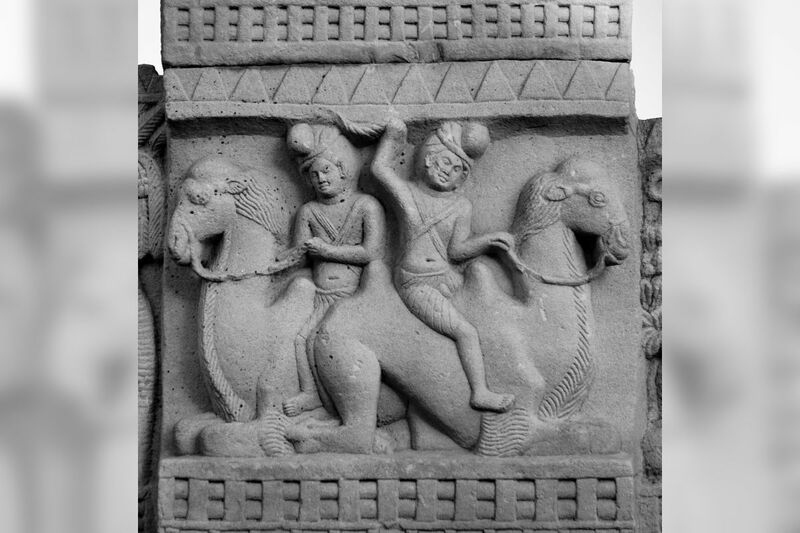 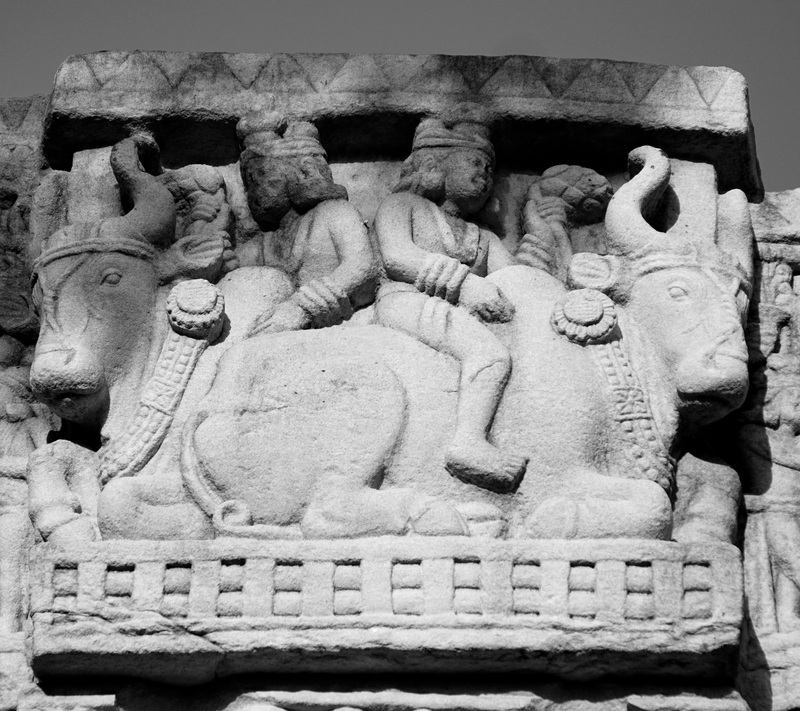 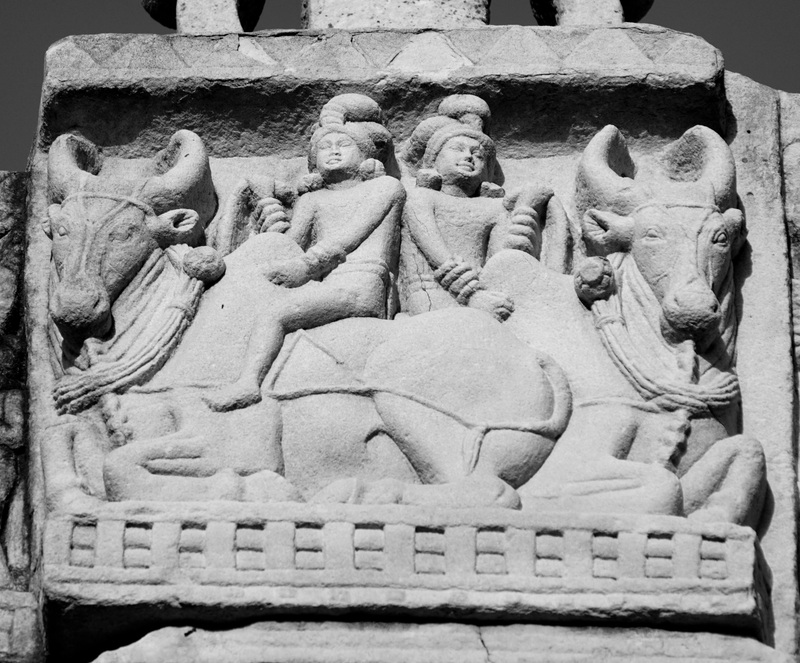 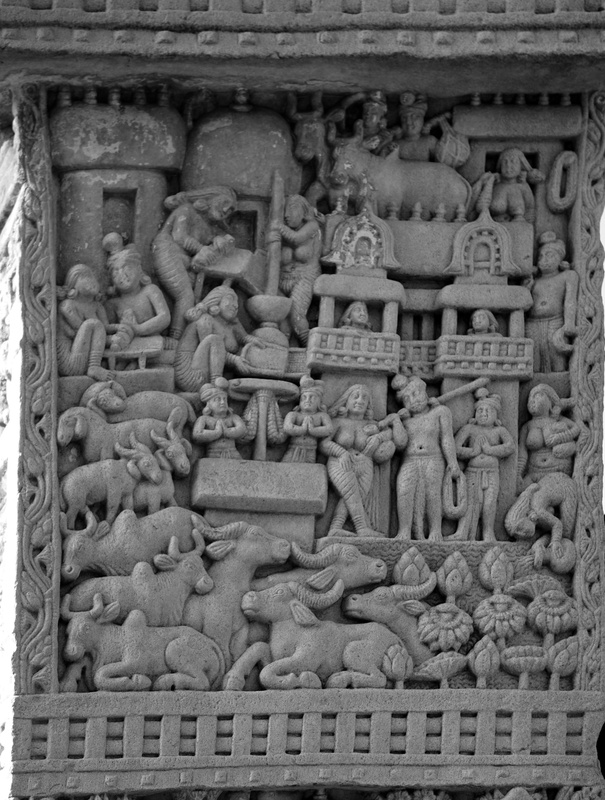 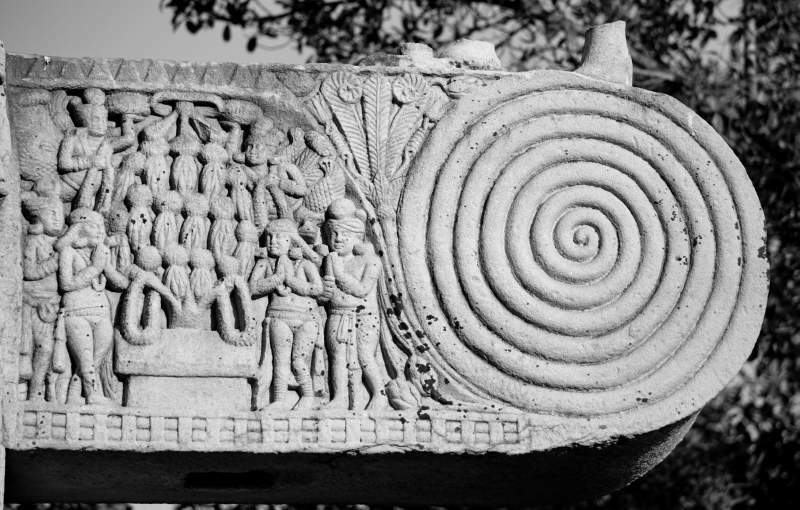 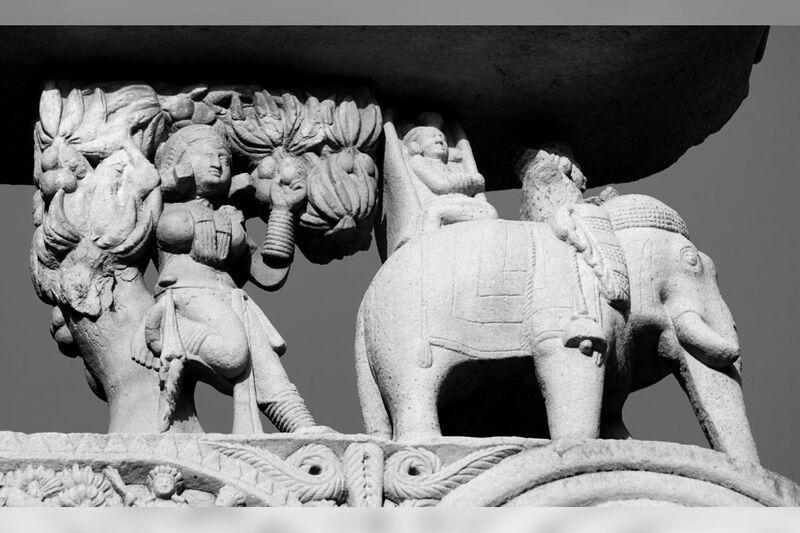 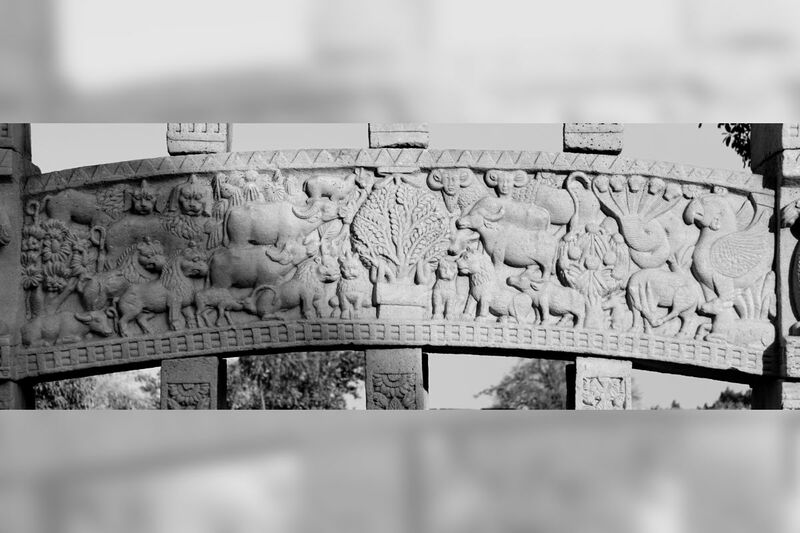 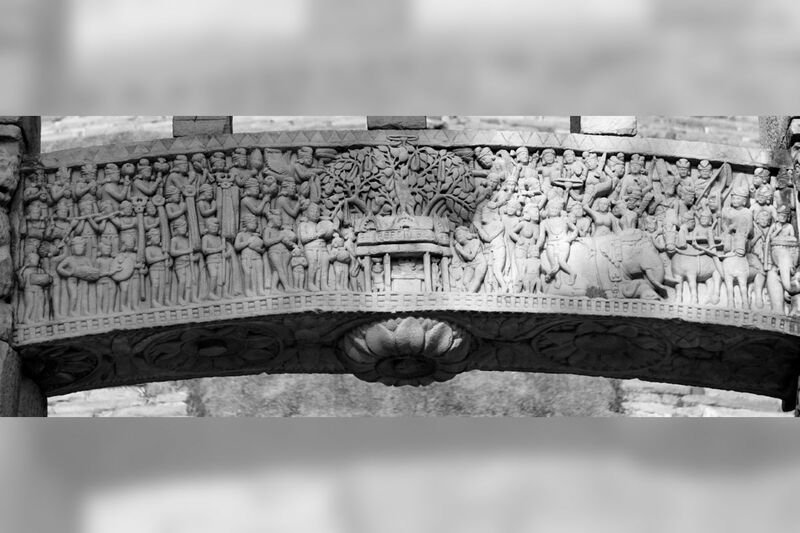 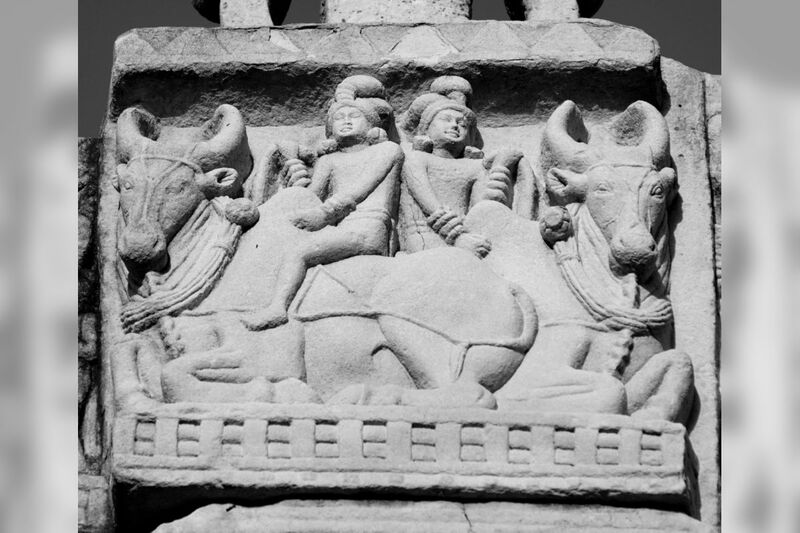 Top Panel – Visit of Indra and Brahmā to Buddha in the town of Uruvilvā. Near the centre of the panel is the throne indicating the presence of the Buddha, surmounted by the umbrella; behind it, Indra and Brahmā, standing in an attitude of adoration; in the background, the houses of Uruvilvā and the people at their daily tasks. 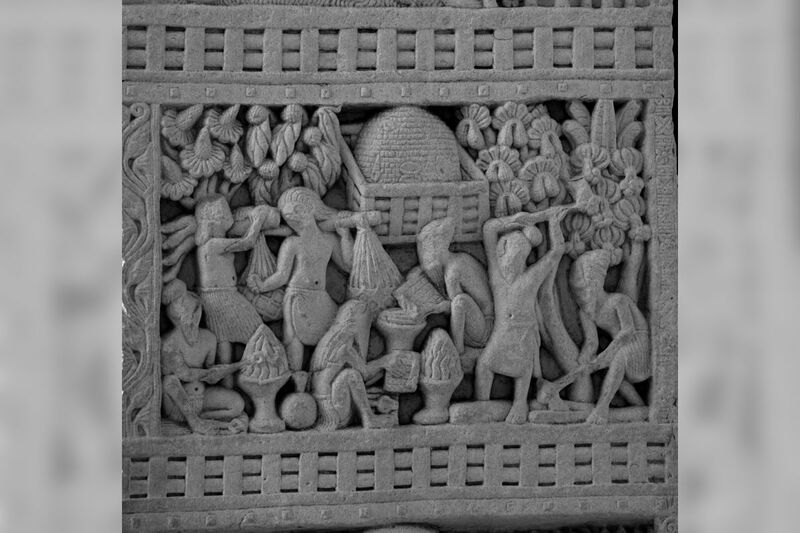 To the left, a man and woman, the woman grinding spices on a "carī stone"; near by, to the right, another woman is at work at a table, while a third is pounding rice with pestle and mortar, and a fourth winnowing the grain with a fan. 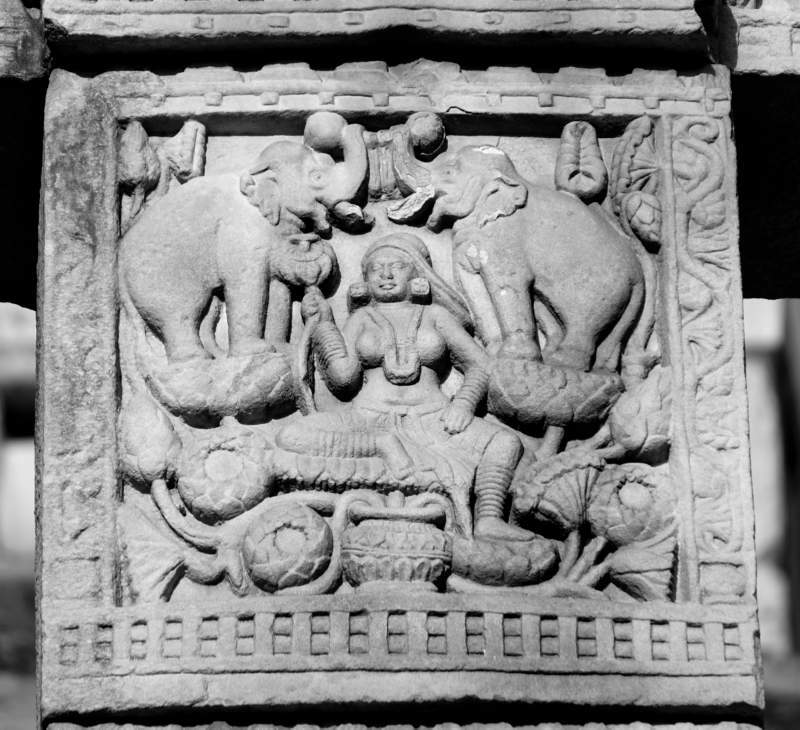 In the foreground is the river Nairañjanā, with cattle on its banks and a woman drawing water in a pitcher. It is noteworthy that only one of the villagers has his hands joined in the attitude of prayer. 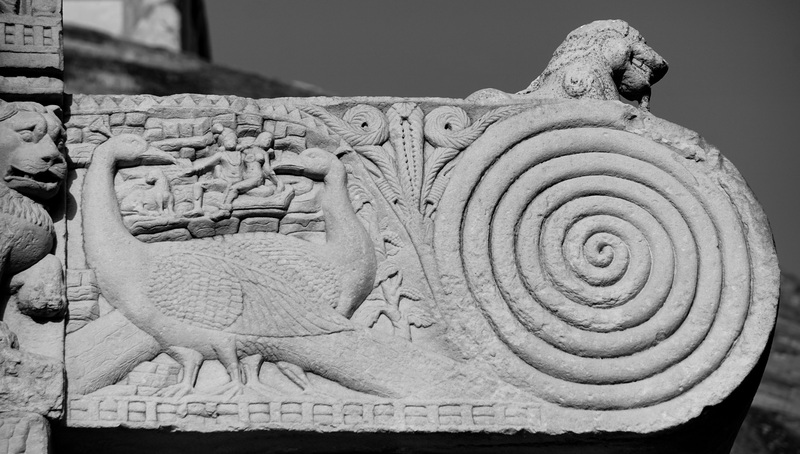 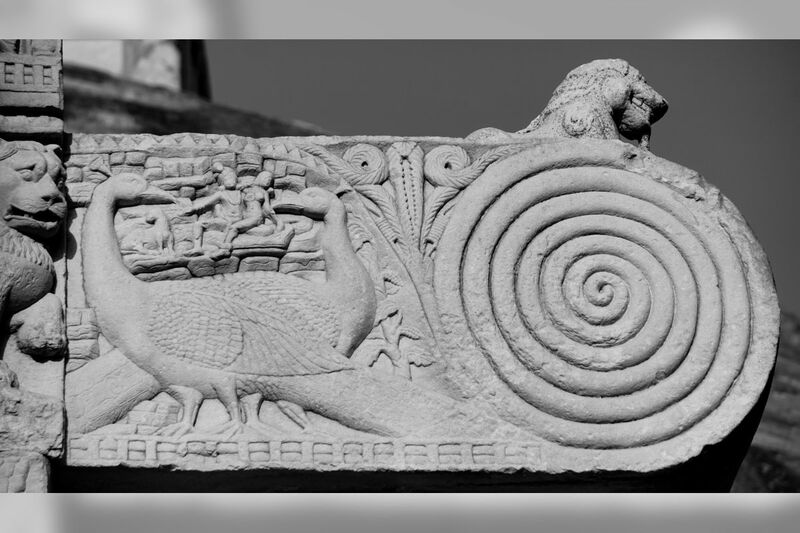 Second Panel – The victory of the Buddha over the serpent in the fire chapel at Uruvilvā. 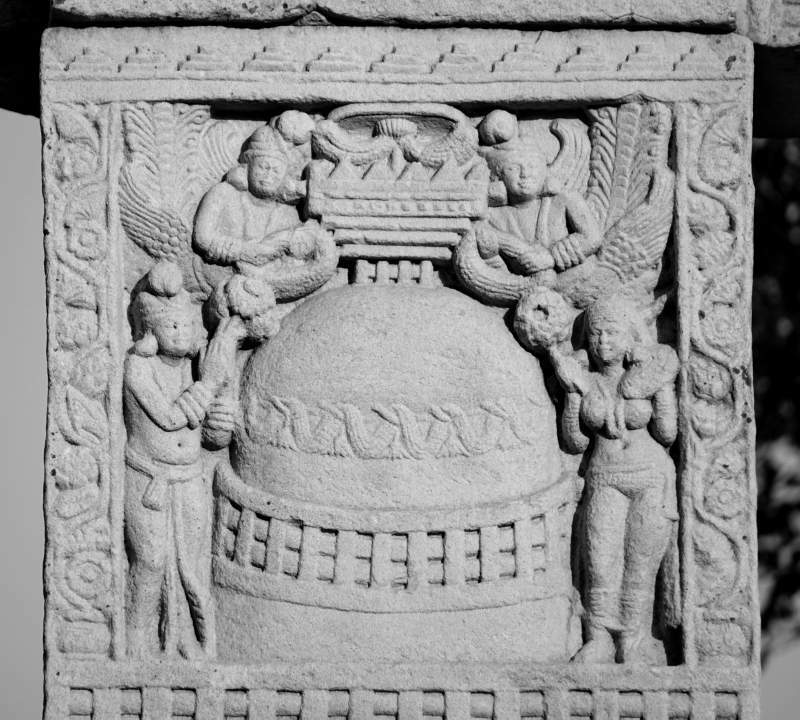 The story is that Buddha obtained the permission of Kāśyapa to pass the night in a fire chapel at his hermitage, which was inhabited by a fearsome nāga. 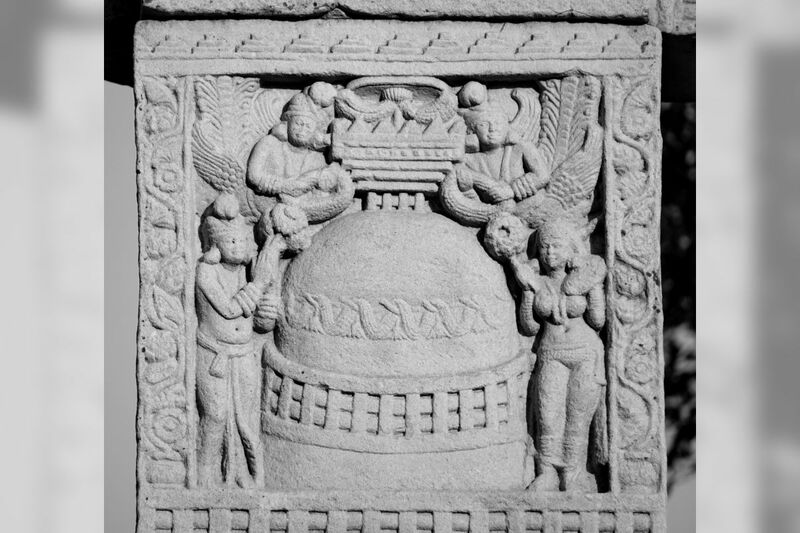 The nāga attacked him with smoke and fire but was met with the same weapons, and being overcome crept into the Buddha's begging bowl. 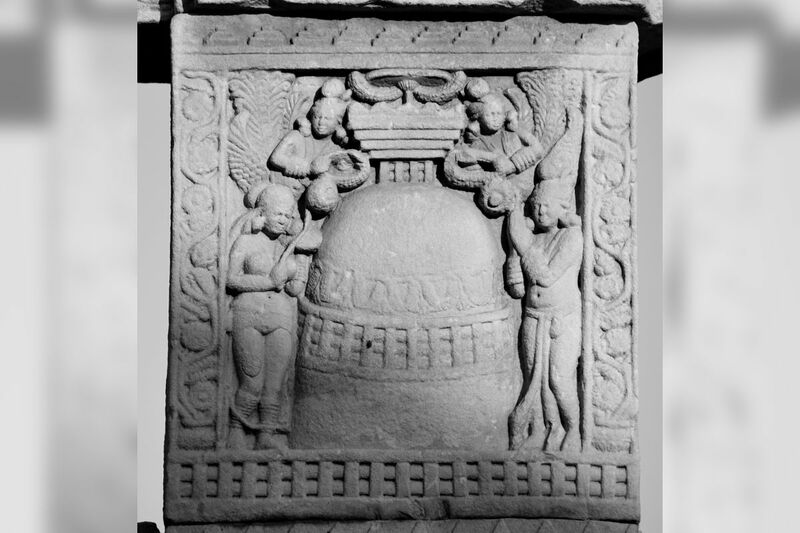 In the middle of the panel is the fire temple with a fire altar in front and a throne indicating the presence of the Buddha within, while behind the throne is the five-headed nāga. Flames are issuing from the windows in the roof. 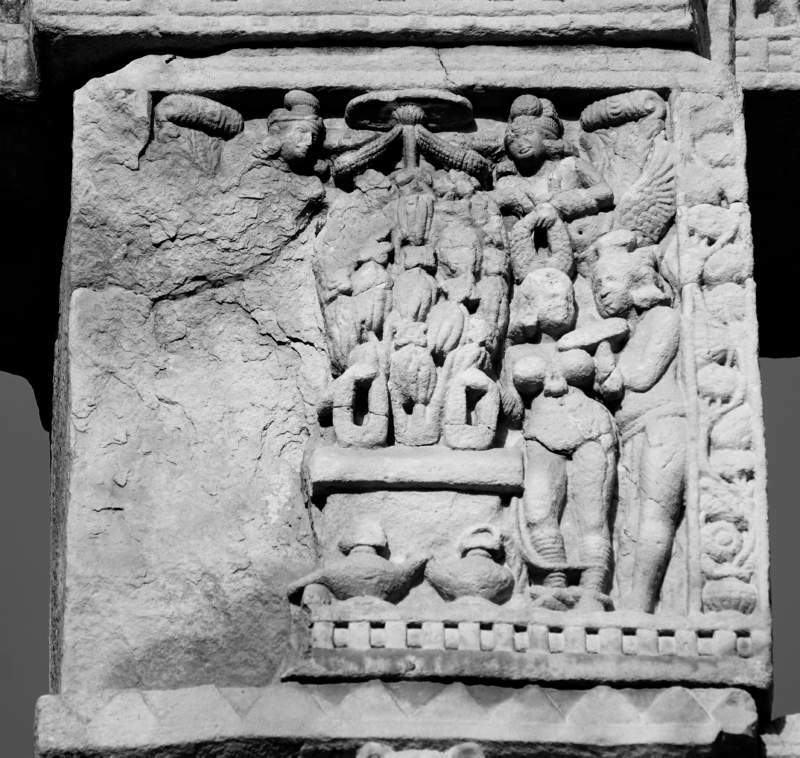 On either side of the temple are the Brahmanical ascetics standing in an attitude of respect and veneration. 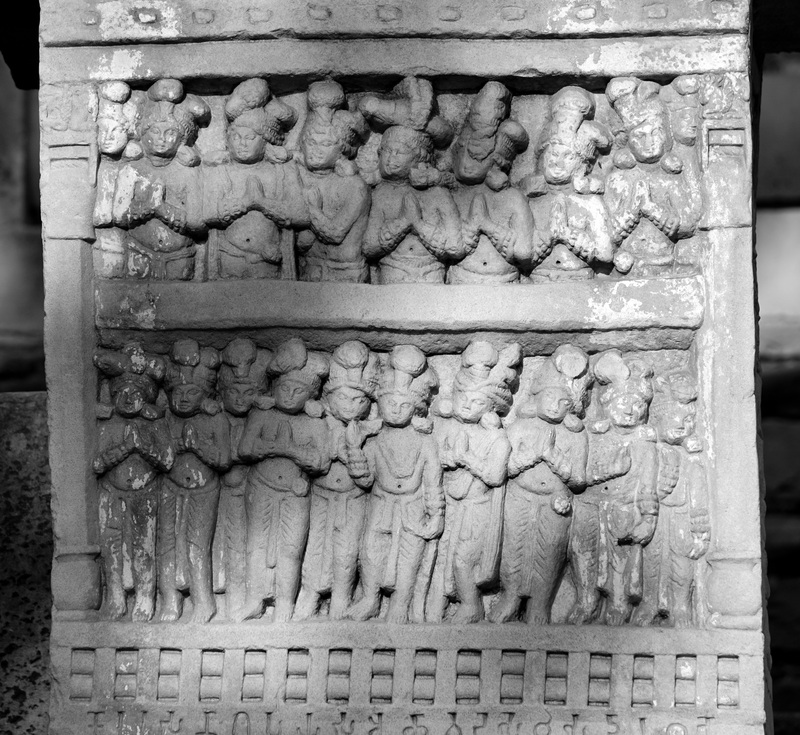 In the foreground, to the right, is a leaf-hut (parṇa-śālā) and an ascetic at its threshold seated on a mat, with his knees bound up by a band and his hair (jaṭā) twisted turban-wise about his head. 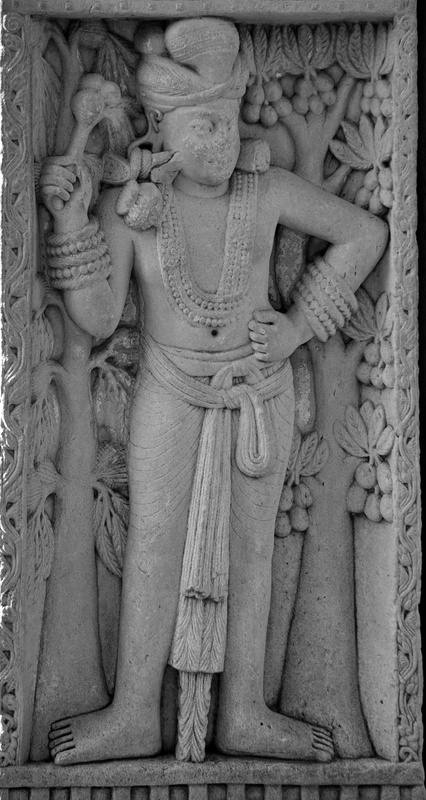 Evidently he is a Brahman doing penance. 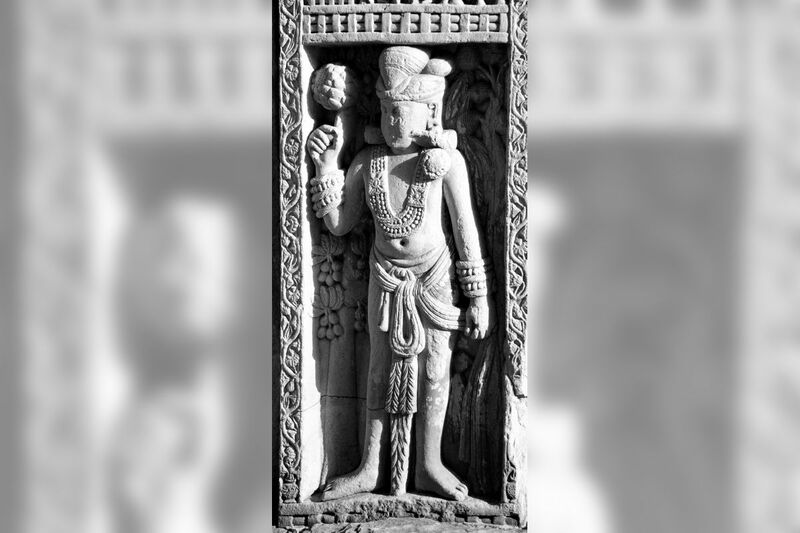 Before him is another Brahman standing and apparently reporting to him the miracle; and near by is a small fire altar and the instruments of Vedic sacrifice. To the left is the Nairañjanā river, in which another ascetic is bathing and from which three young novices are drawing water. 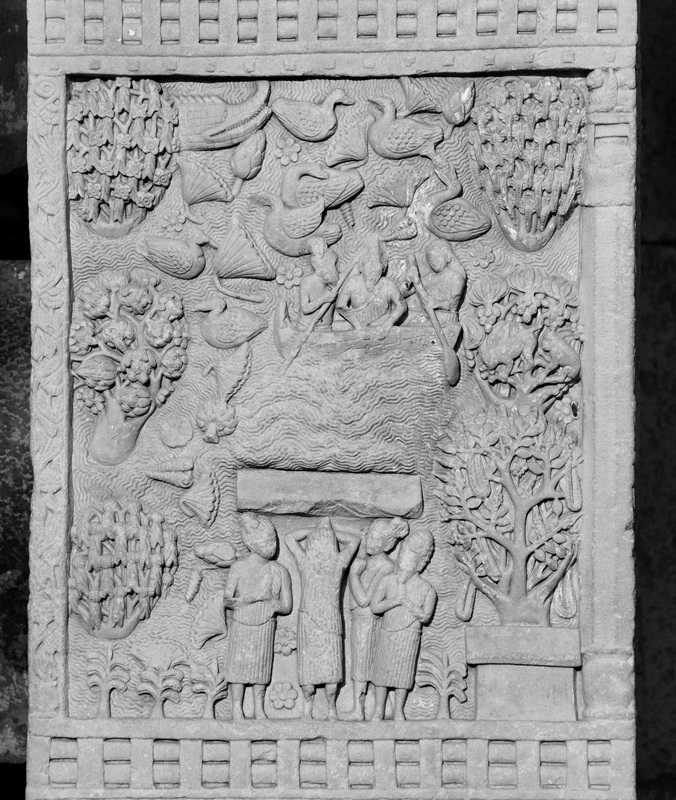 Third Panel : – The miracles of the wood, the fire and the offering. 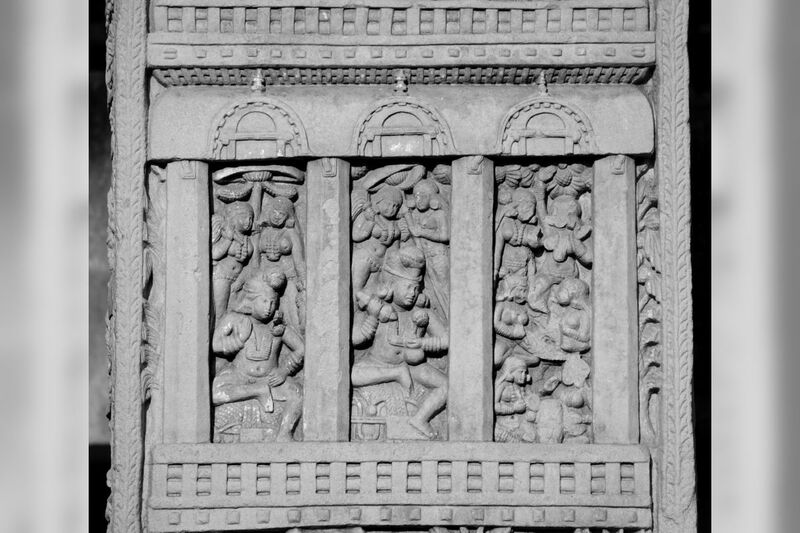 In the story of Kāśyapa's conversion it is related that, after the miracle of the fire temple, a sacrifice was prepared by the Brahmans, but the wood for the fire could not be split, the fire could not be made to burn, and the oblation could not be offered, until in each case the Buddha gave his consent. 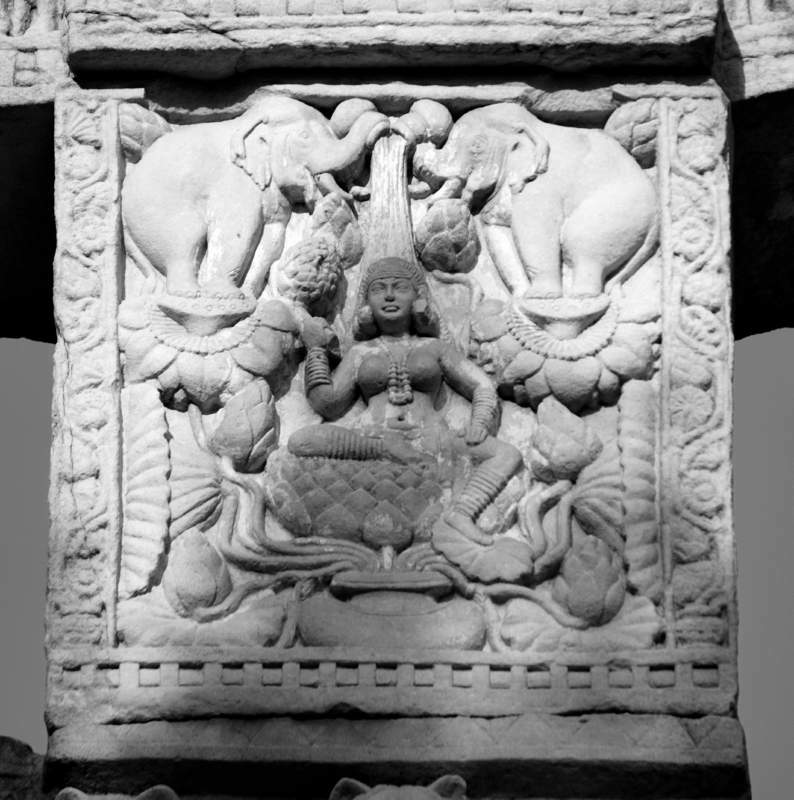 In the relief, this triple miracle is dramatically represented. 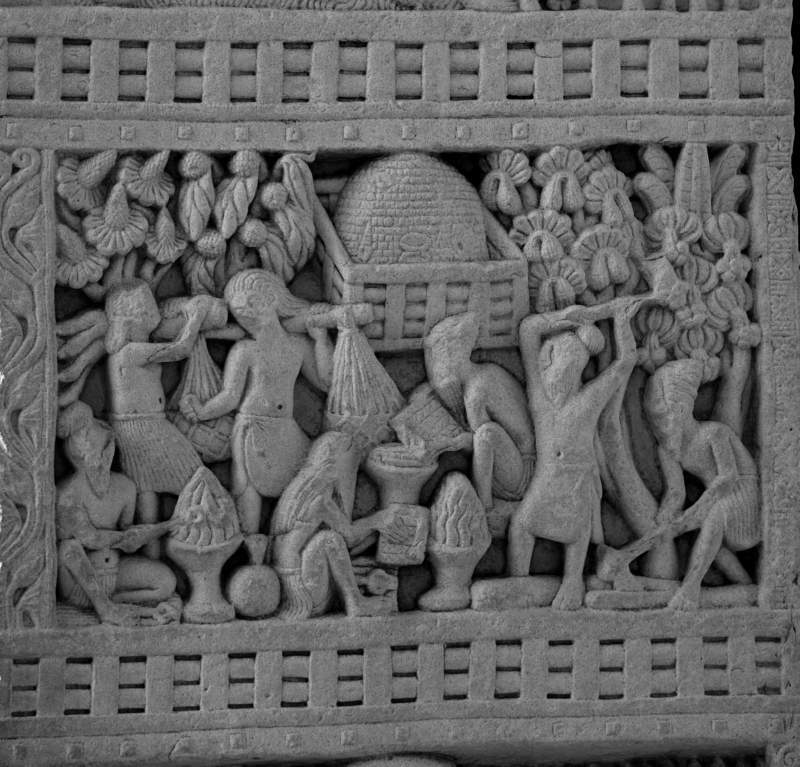 In the foreground, to the right, a Brahman ascetic has his axe raised to split the wood, but the axe will not descend until Buddha gives the word; then we see the axe driven home into the log. 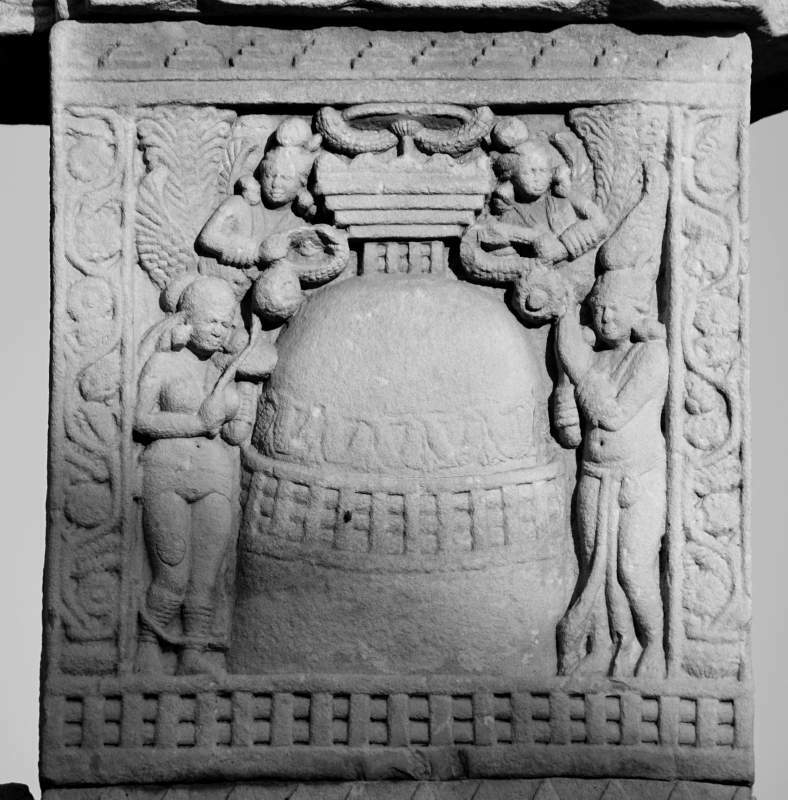 Similarly, a Brahman is engaged fanning the fire on an altar, but the fire will not burn until Buddha permits it. 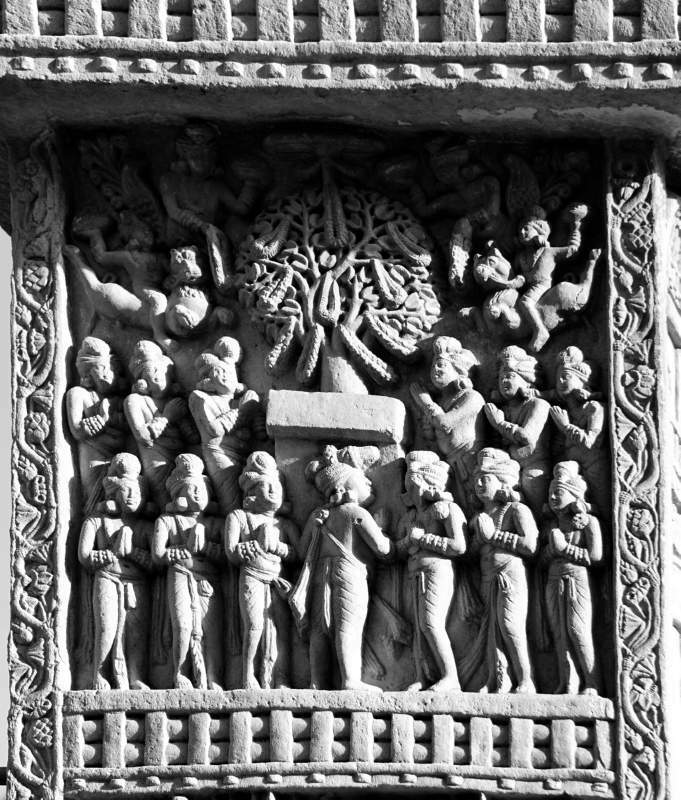 Then we see the altar repeated and flames blazing upon it. 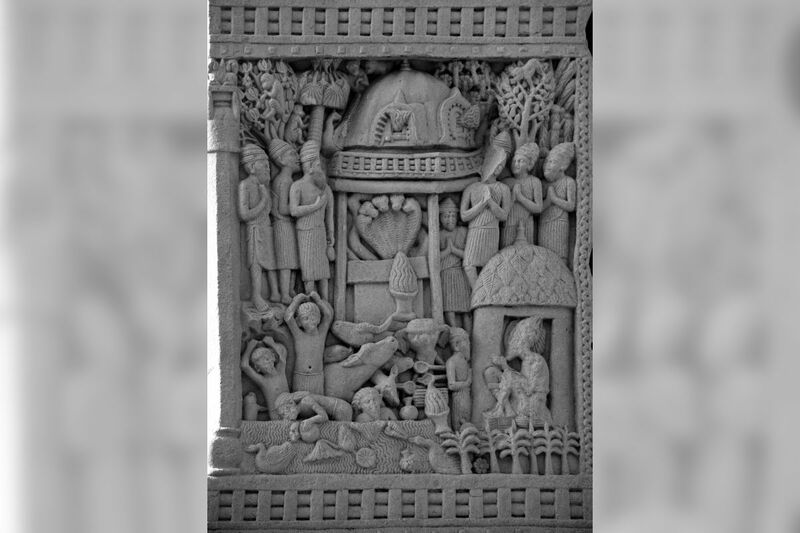 The third phase of the miracle, that of the oblation, is indicated by the single figure of a Brahman holding an oblation spoon over a flaming altar. 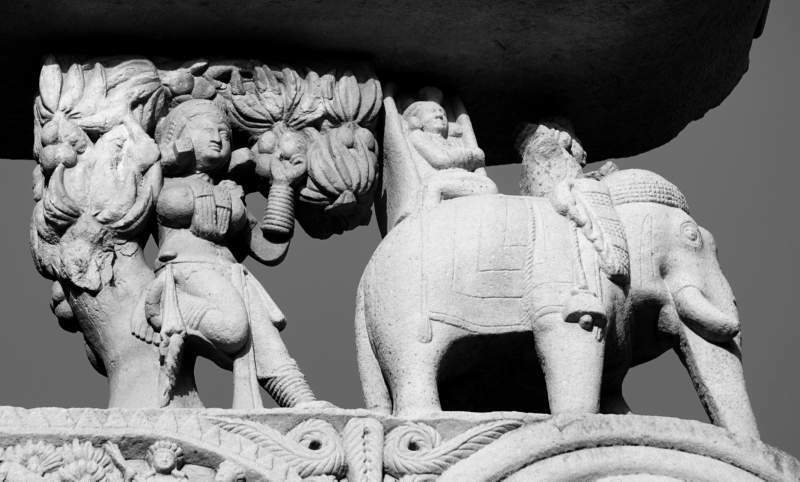 The other figures in this panel, of two novices -bringing wood and provisions, are mere accessories, while the stūpa in the background, decorated with shell designs and surrounded by a square railing, serves to give local colour to the scene.